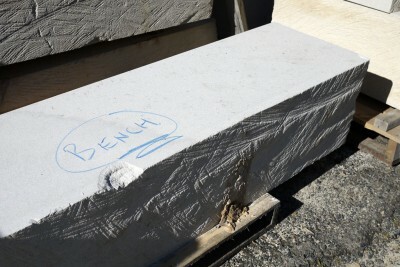 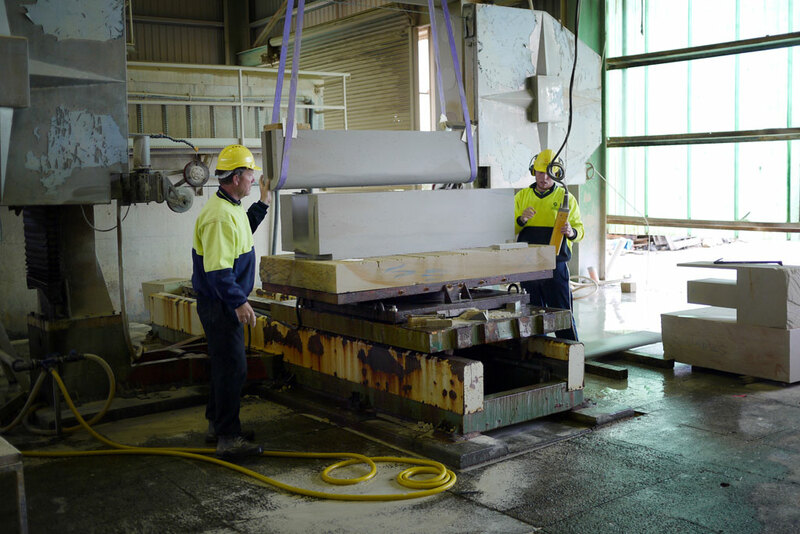 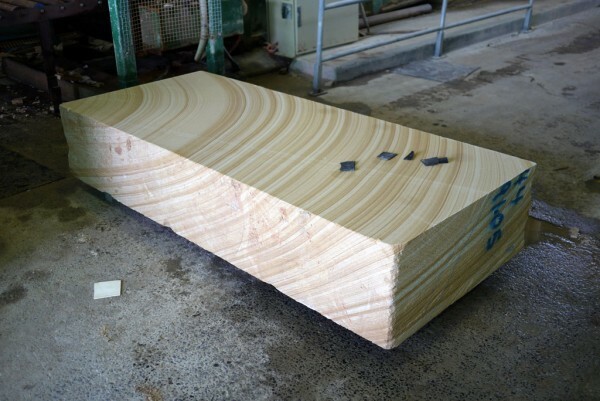 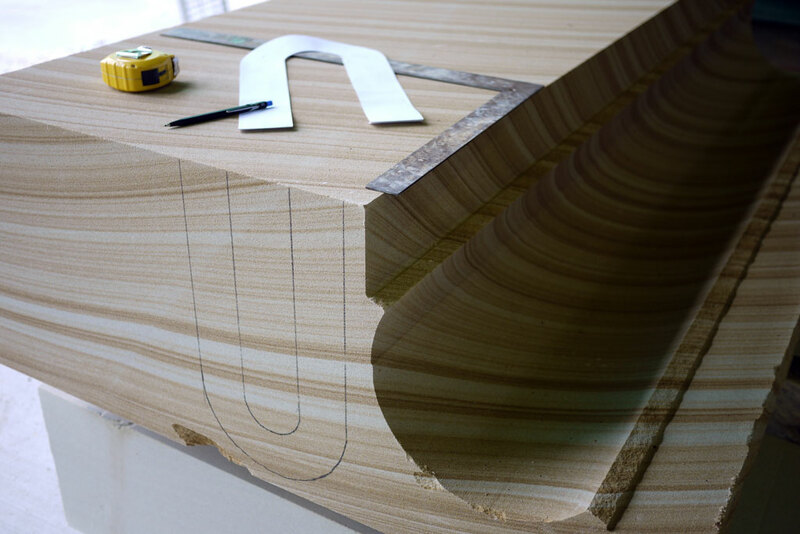 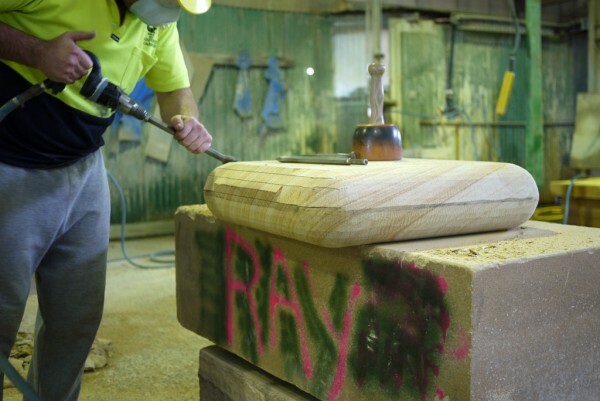 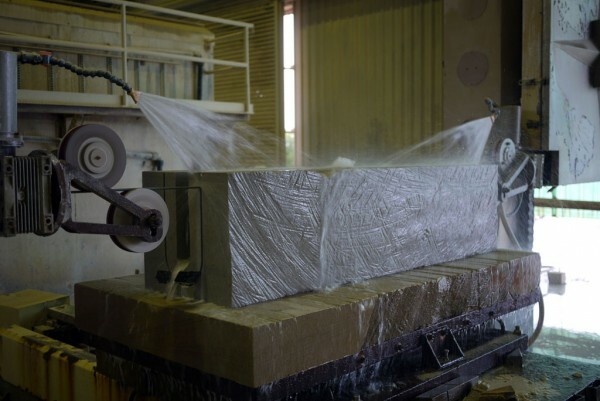 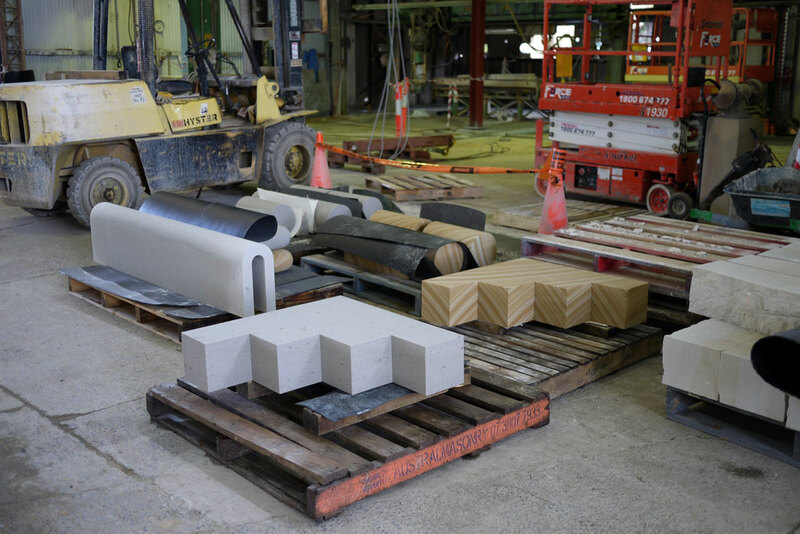 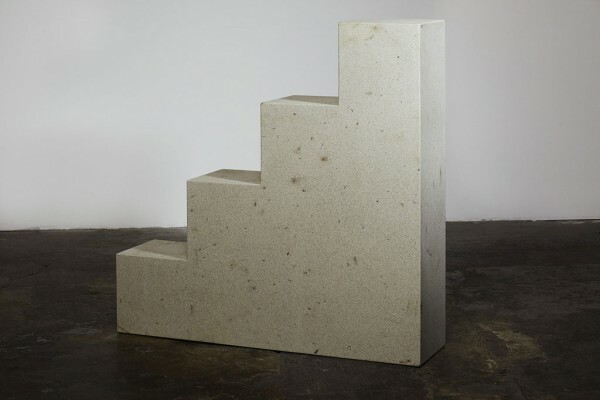 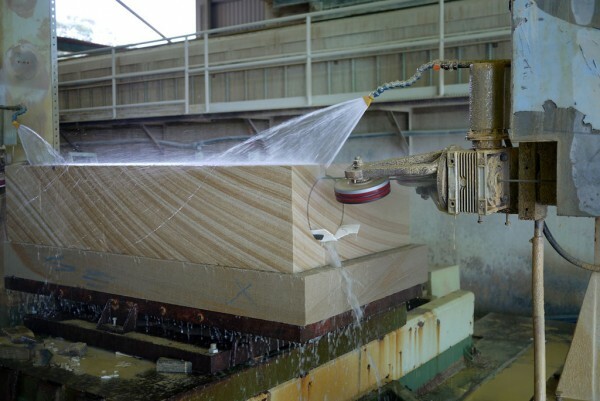 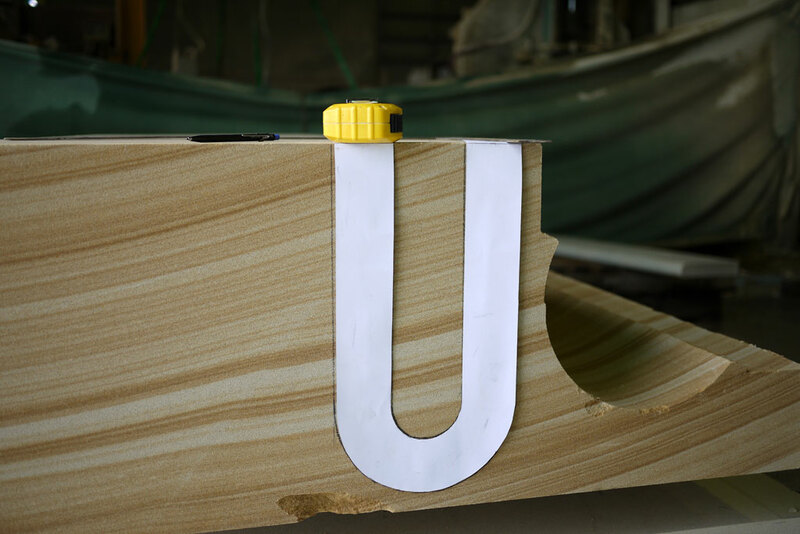 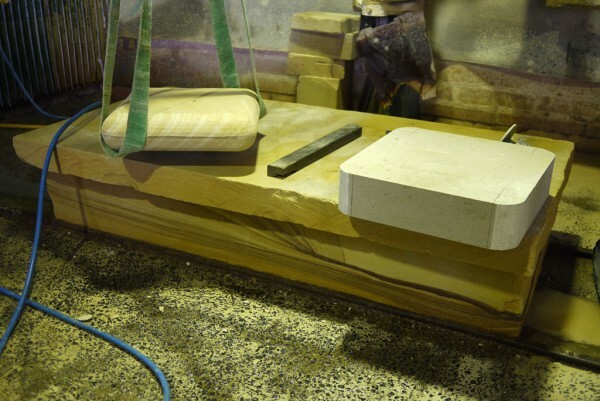 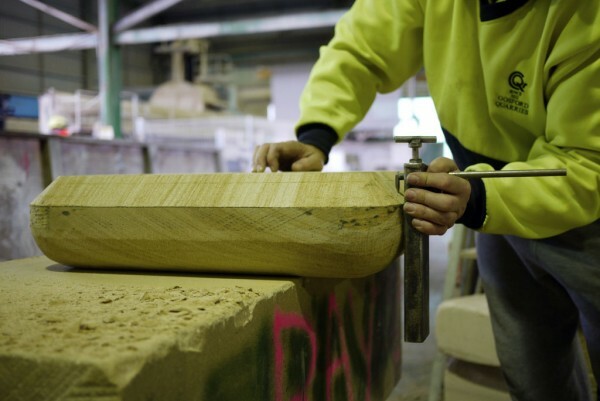 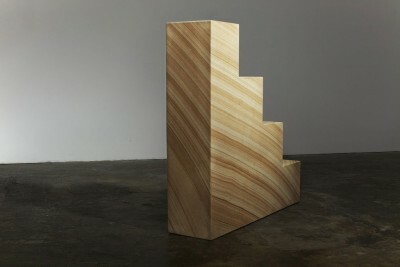 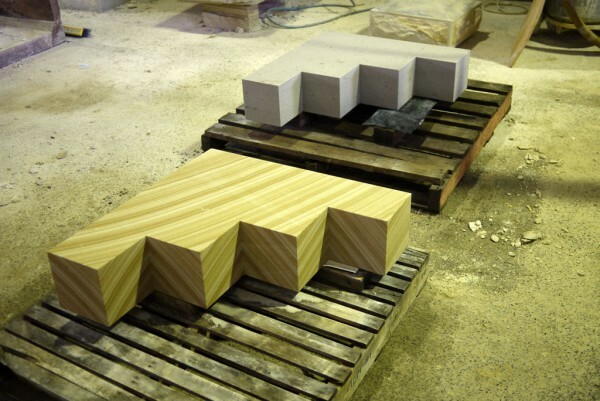 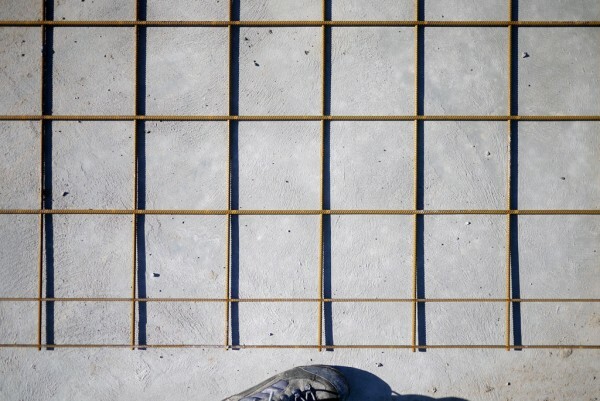 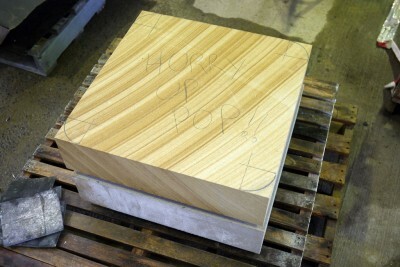 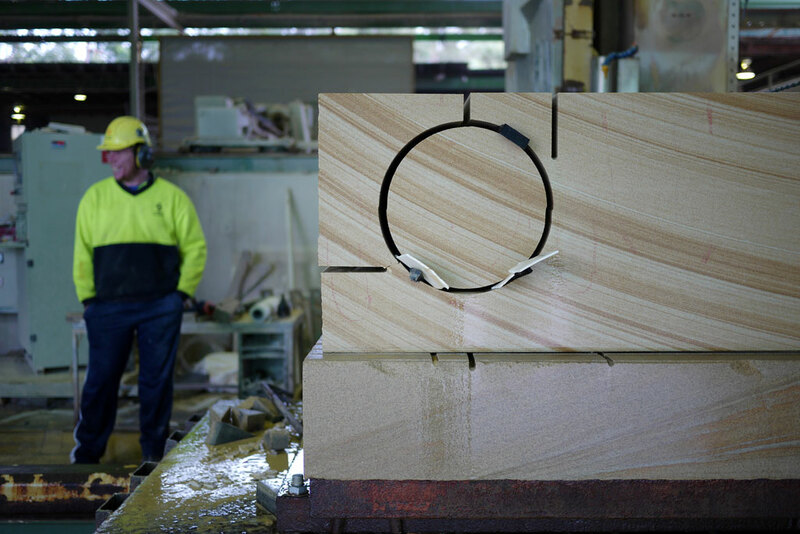 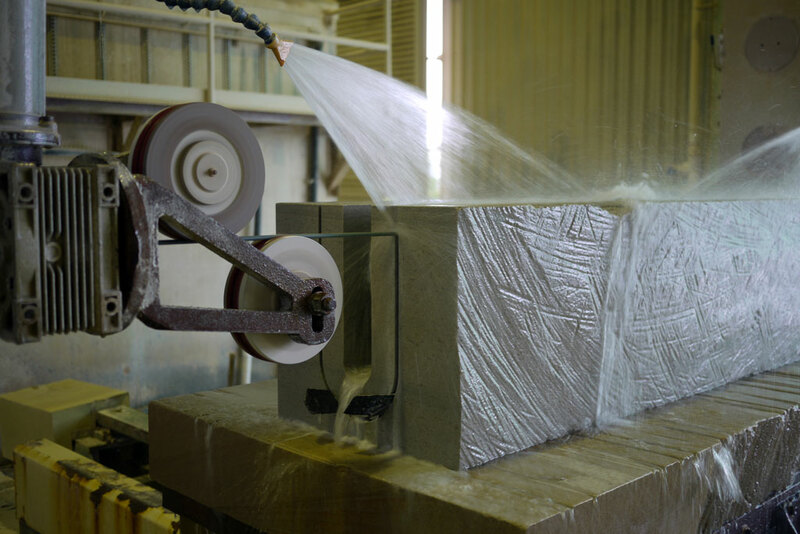 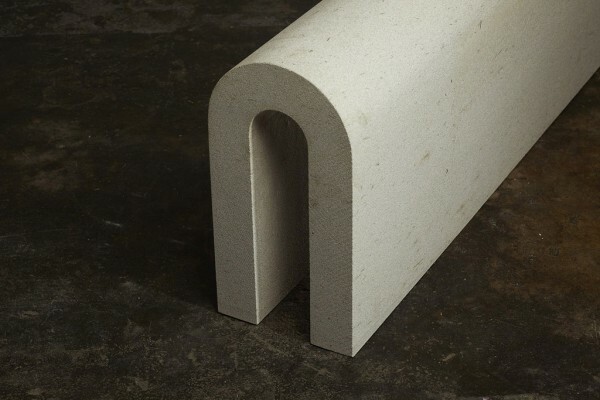 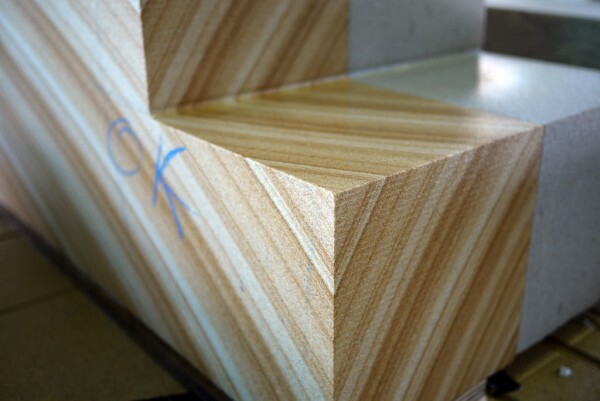 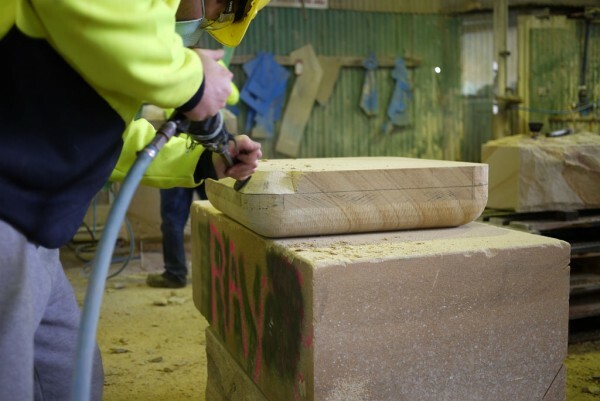 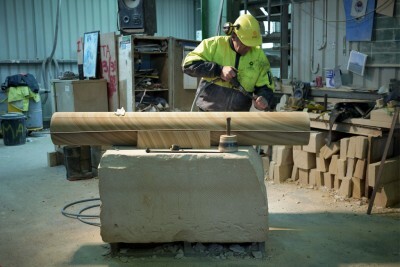 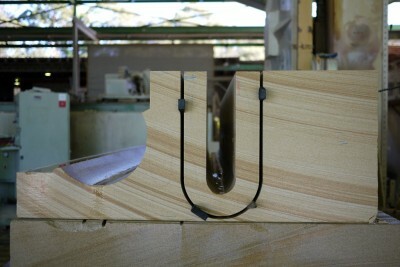 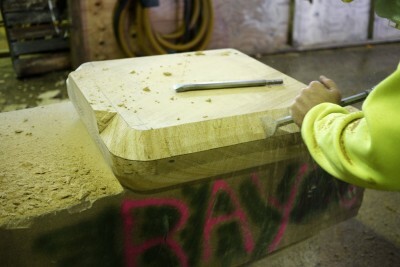 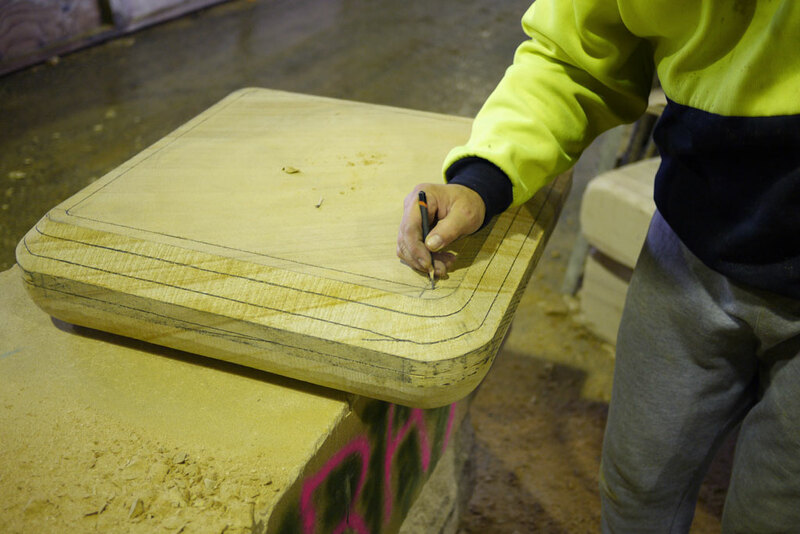 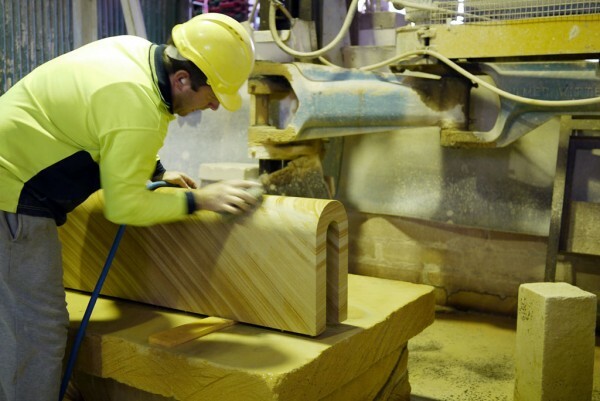 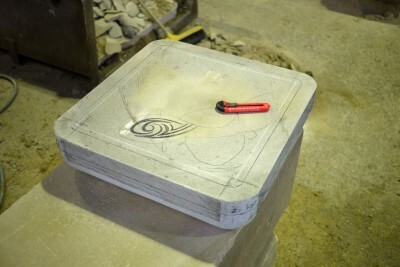 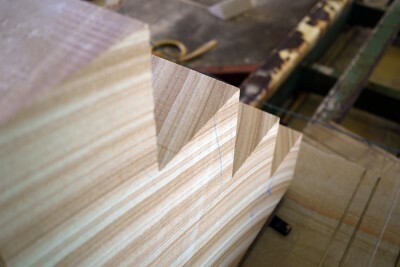 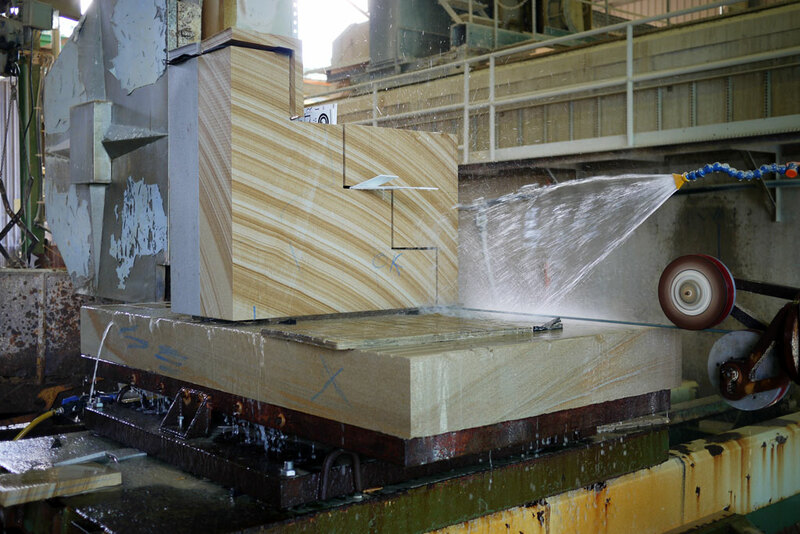 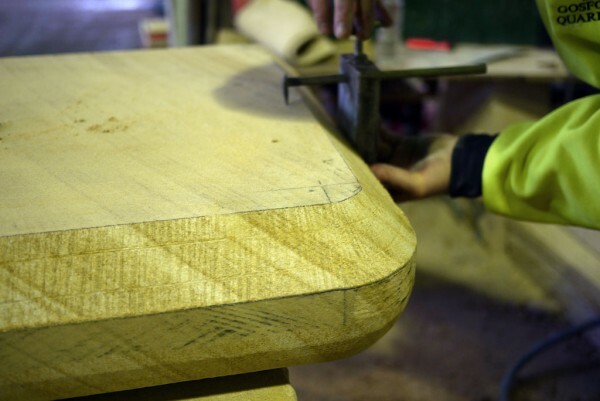 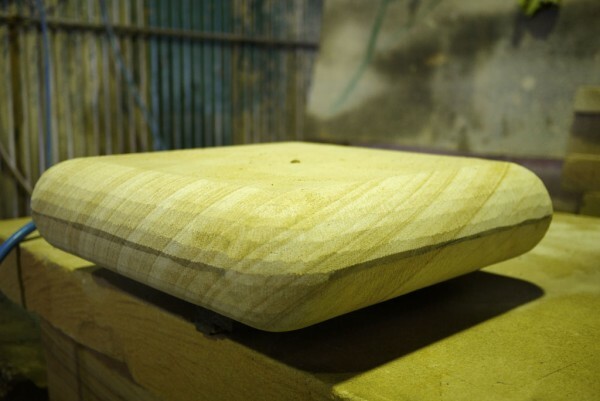 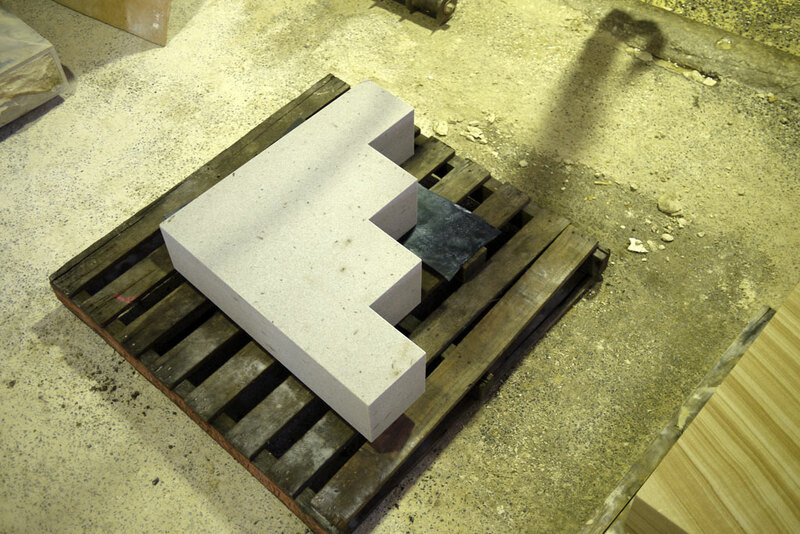 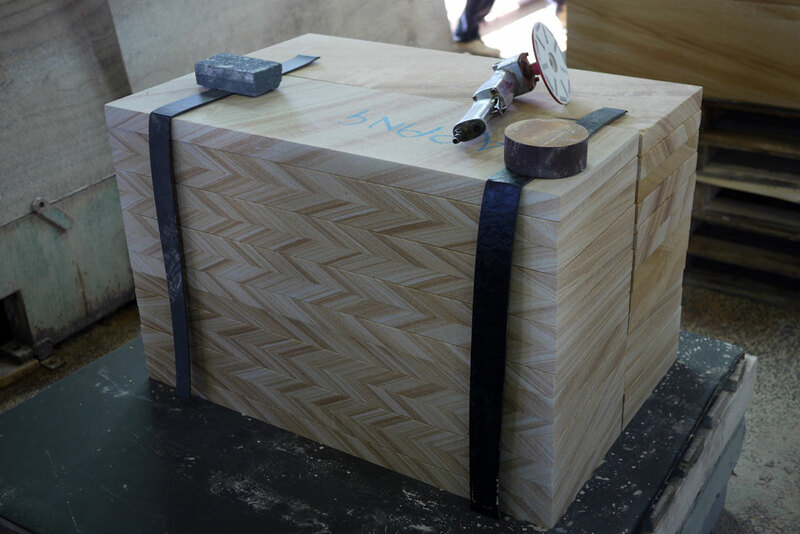 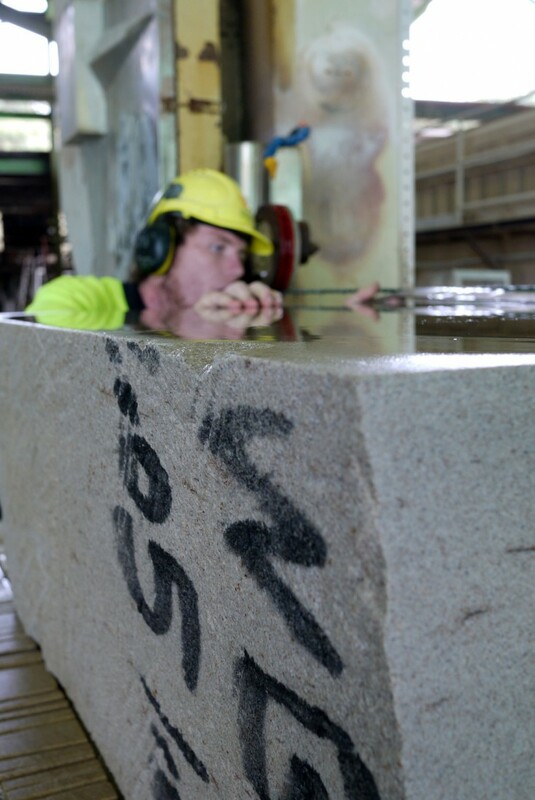 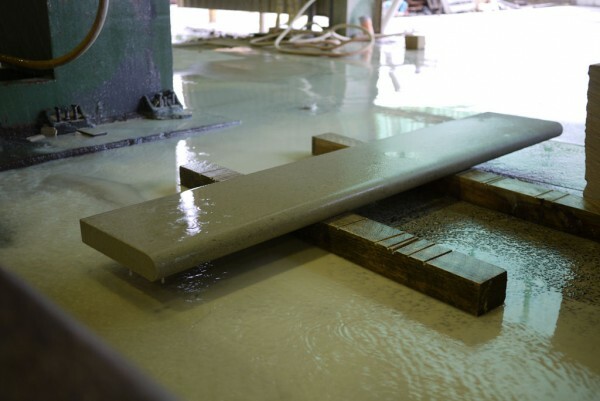 The Hawkesbury Sandstone Collection consists of a set of steps, a table, four stools and a bench, each piece cut using a CNC diamond wire saw and finished by the stonemasons at Gosford Quarries, NSW, Australia. 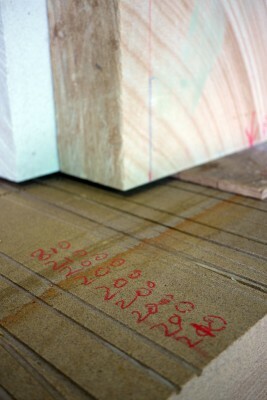 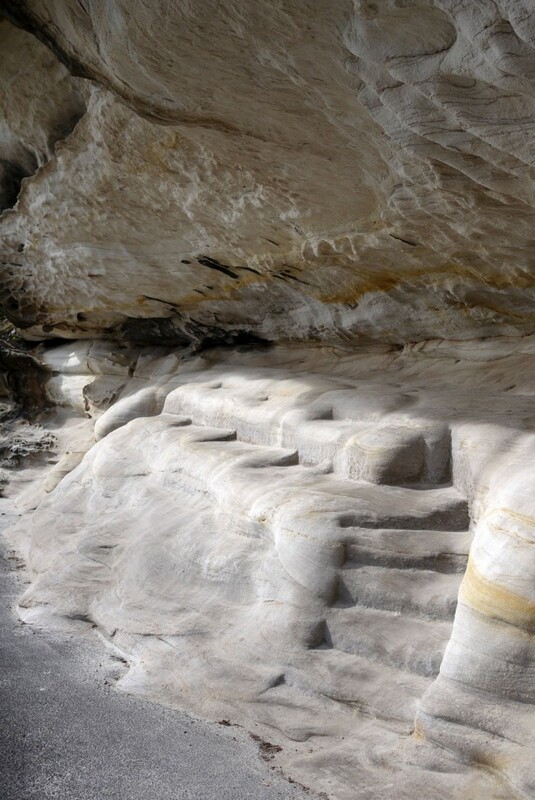 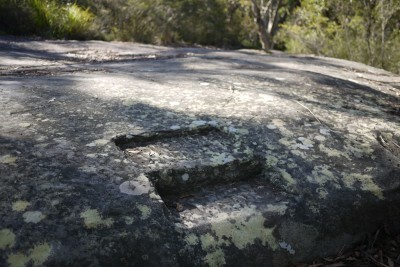 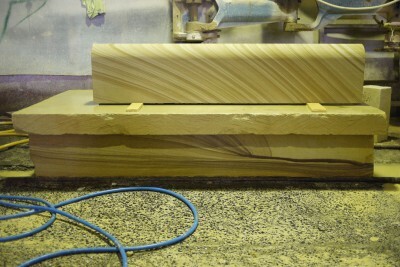 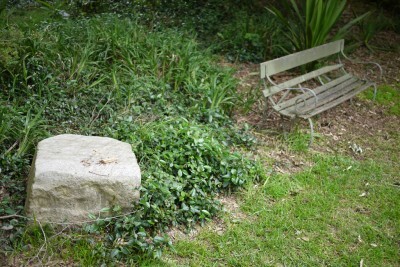 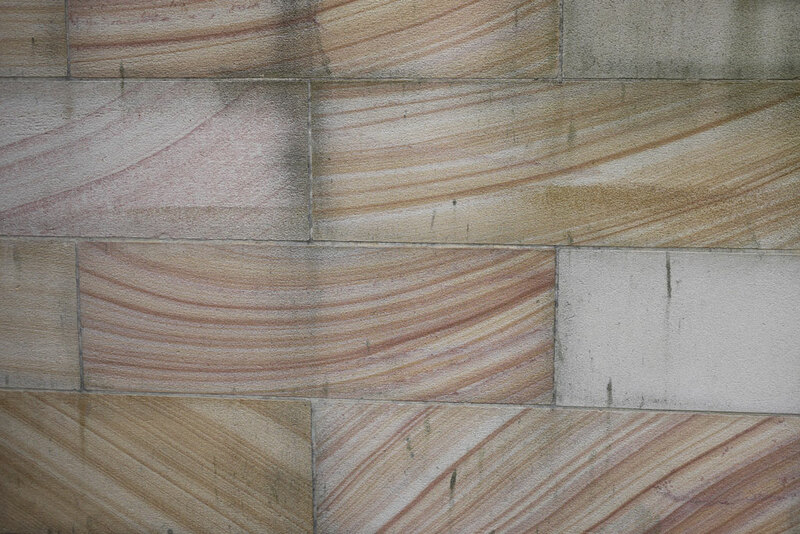 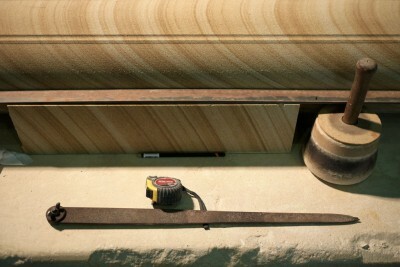 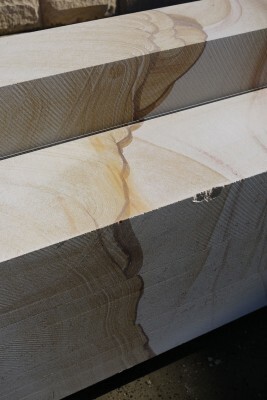 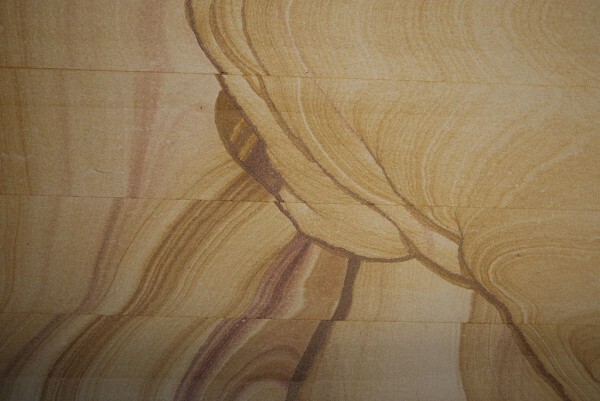 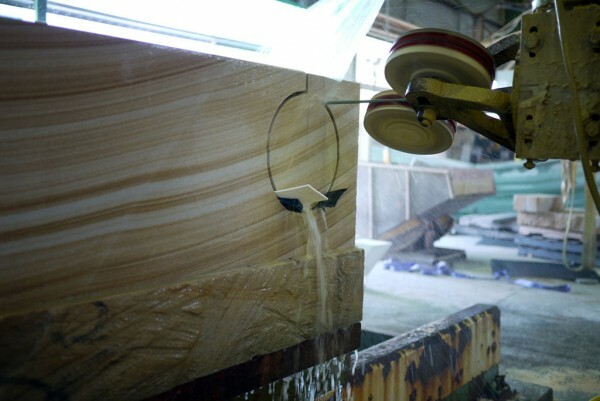 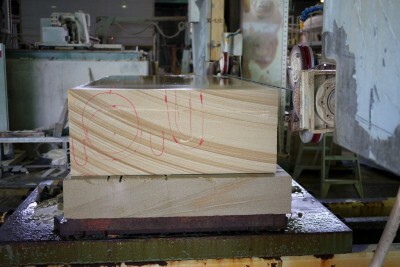 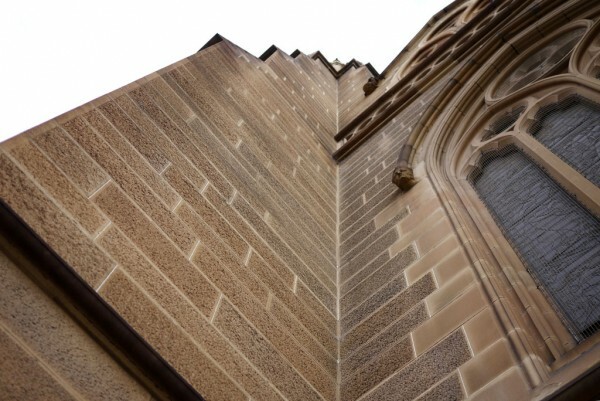 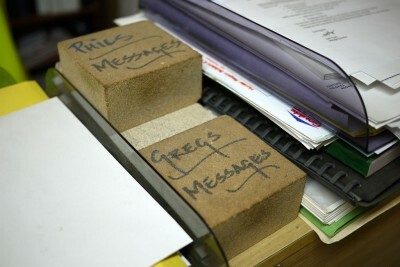 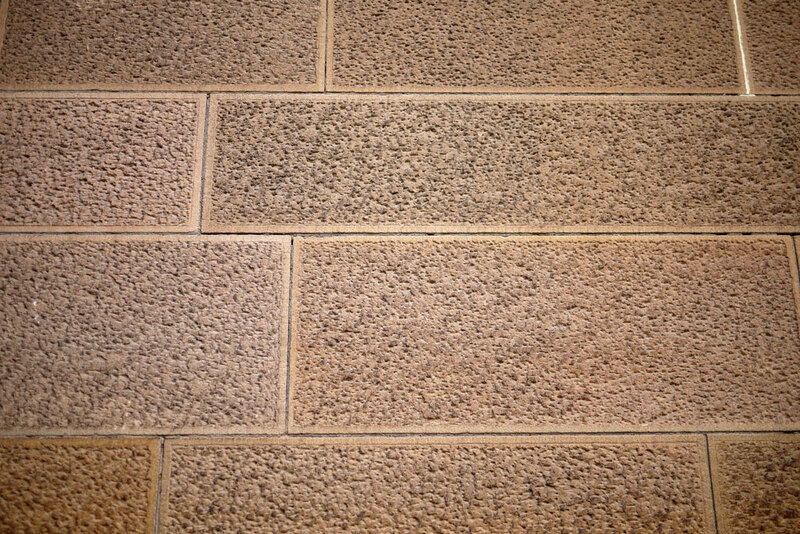 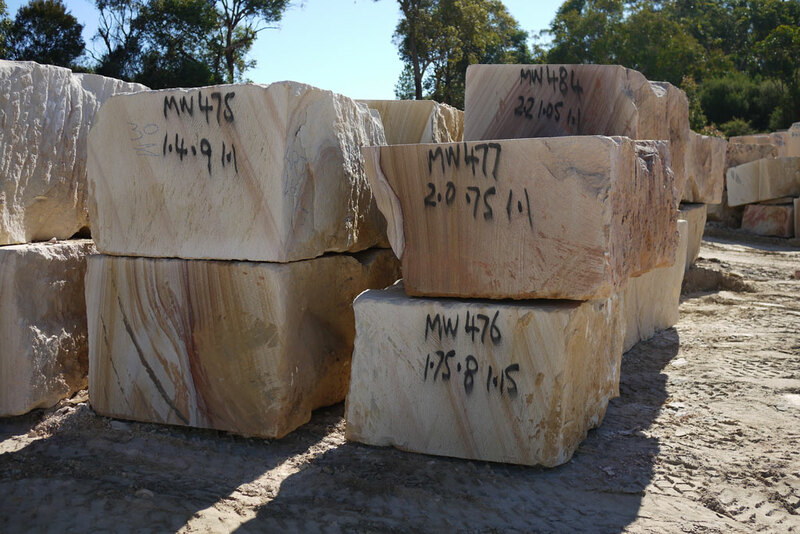 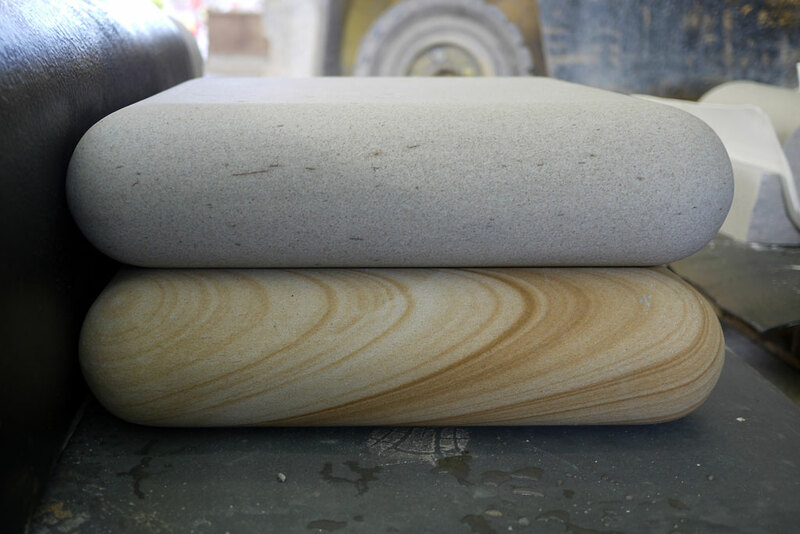 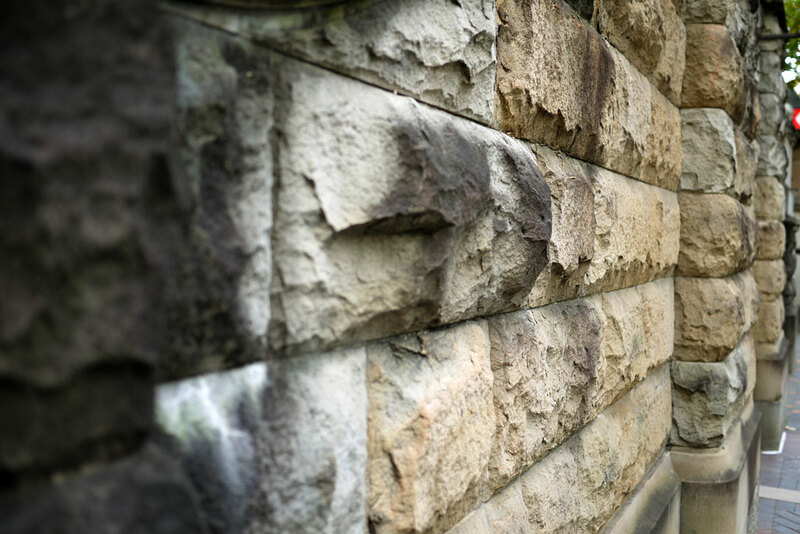 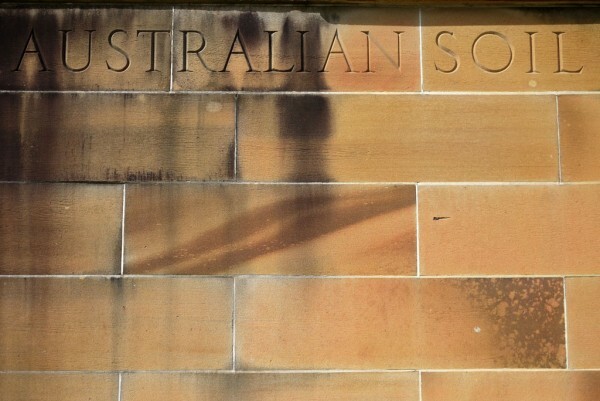 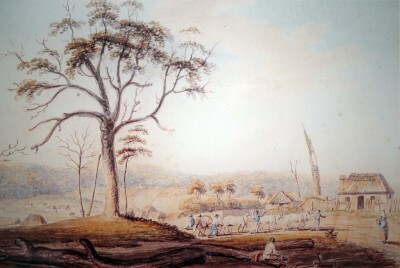 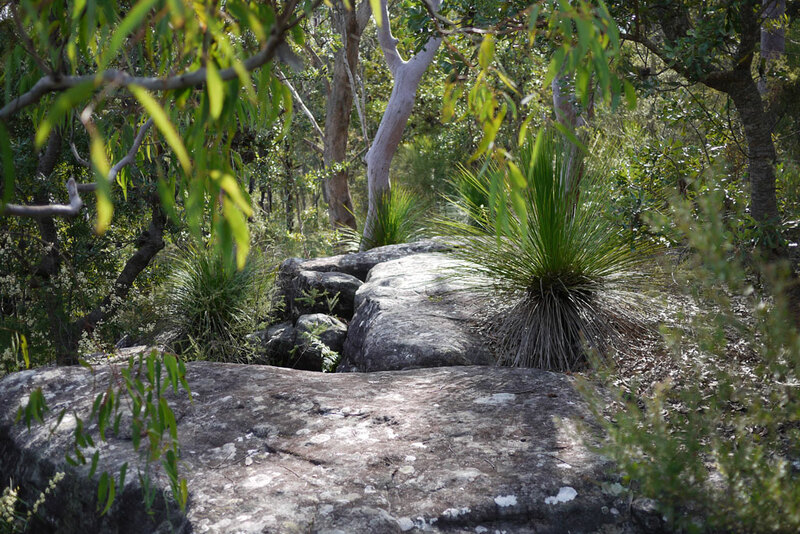 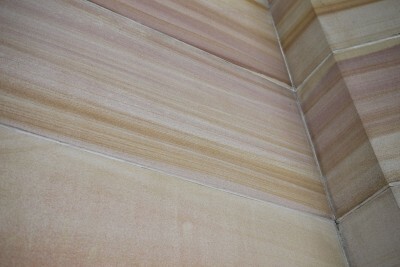 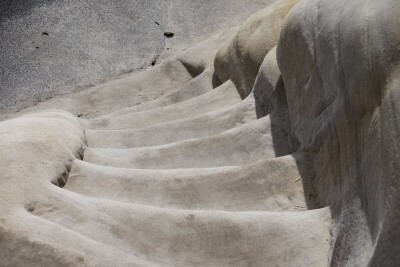 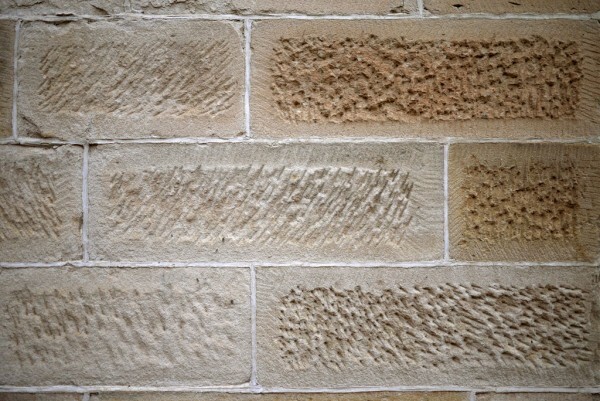 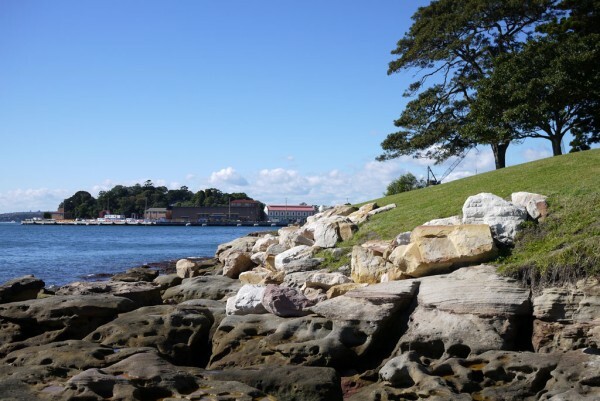 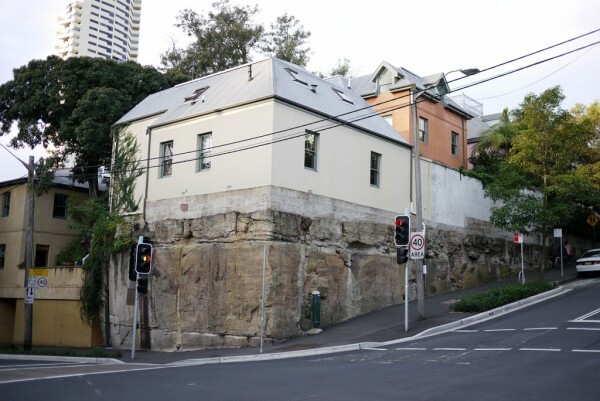 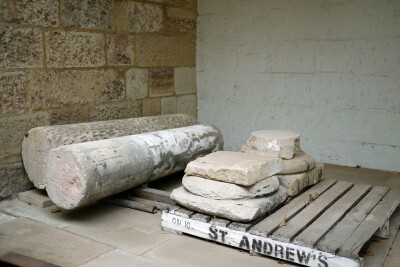 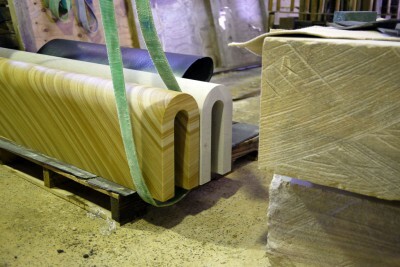 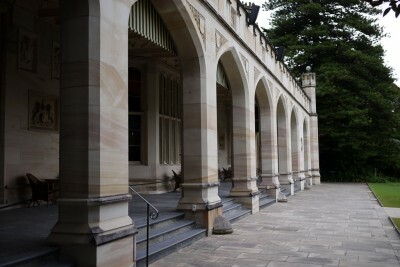 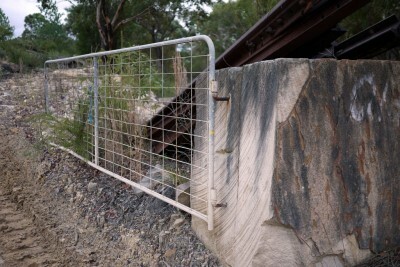 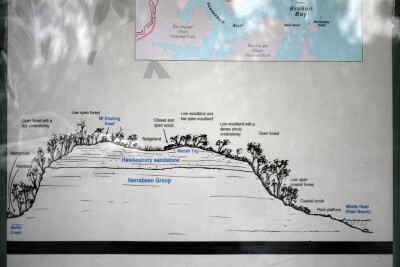 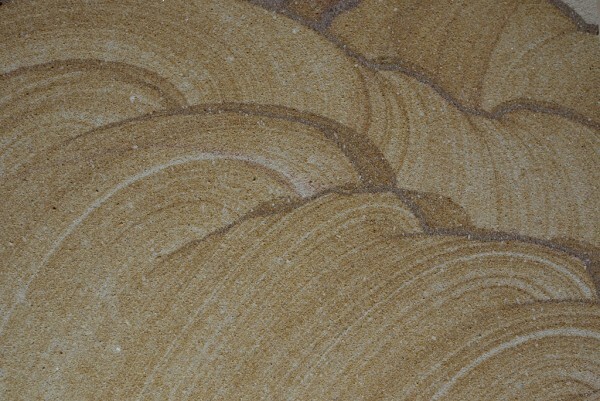 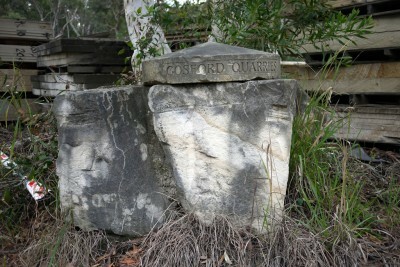 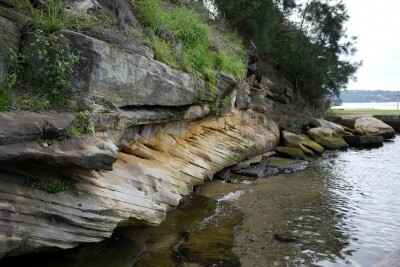 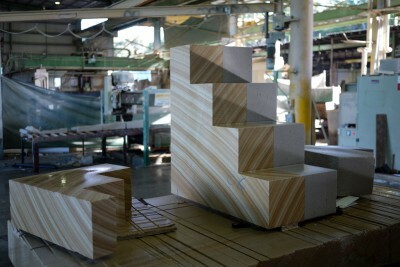 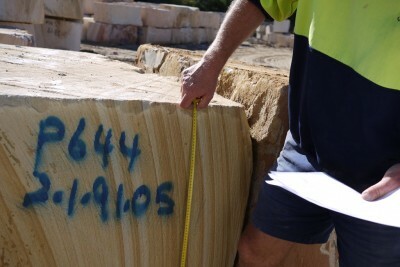 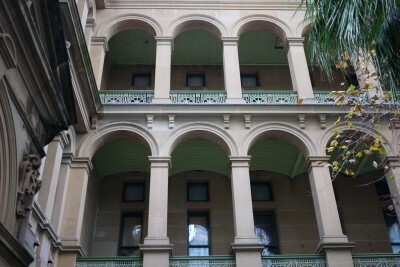 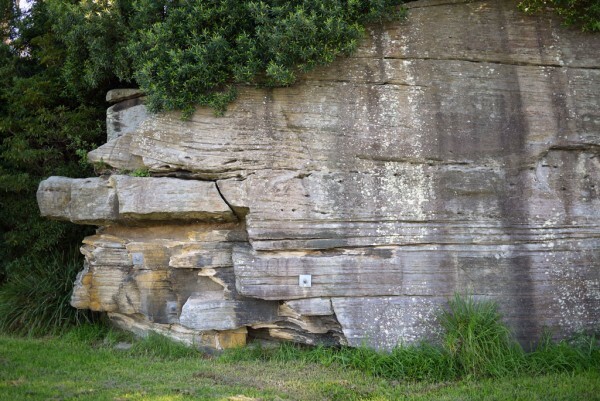 In response to the Broached Colonial commission, I chose to work with both the distinctive yellow-banded sandstone and pure white sandstone native to the Sydney Bay area — these would have been a prominent feature of the landscape when the First Fleet arrived in 1788, and were a readily available natural resource on my arrival in 2011. 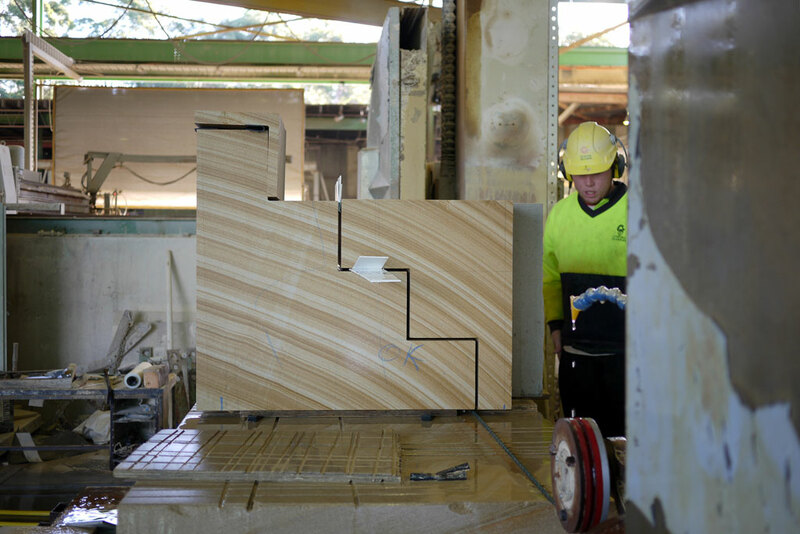 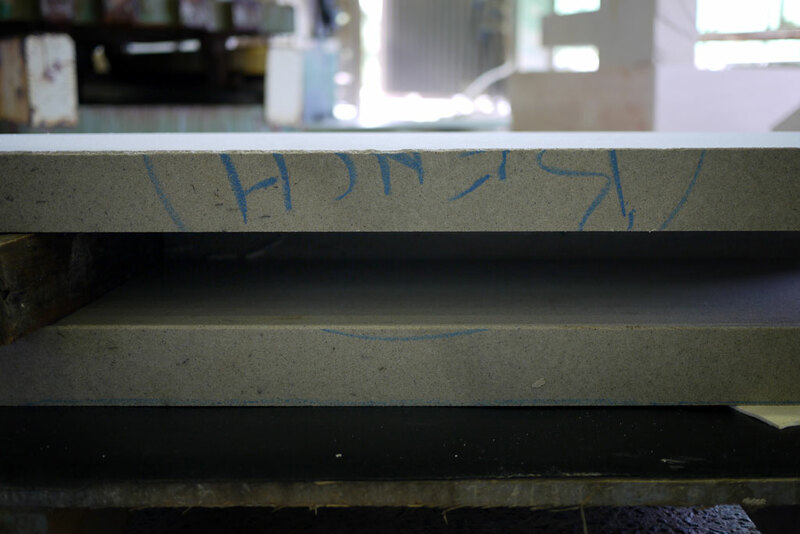 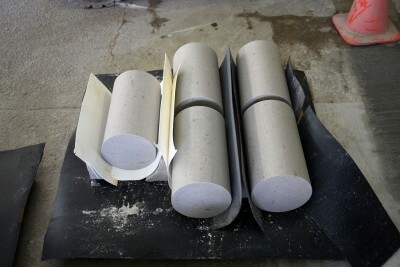 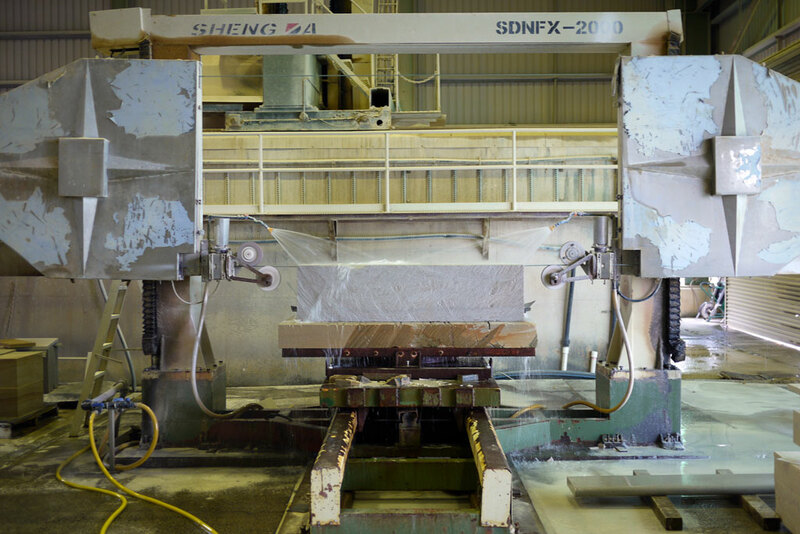 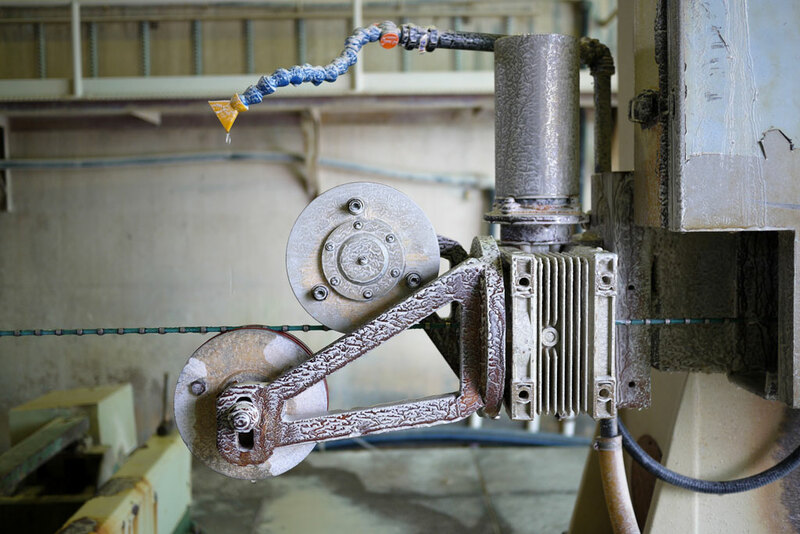 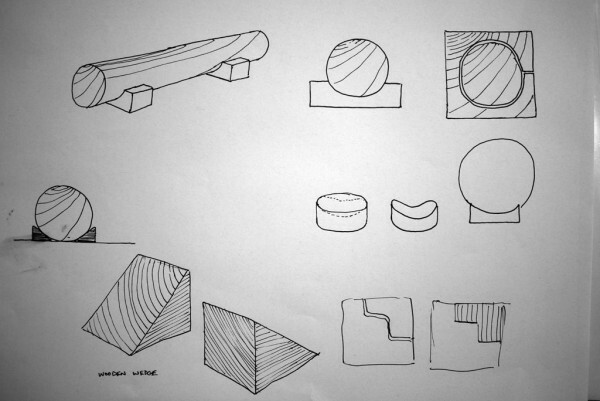 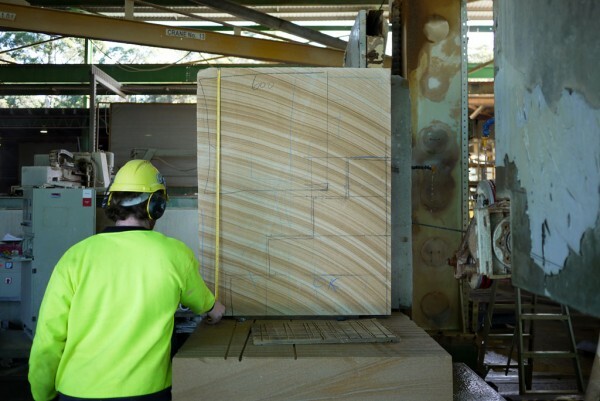 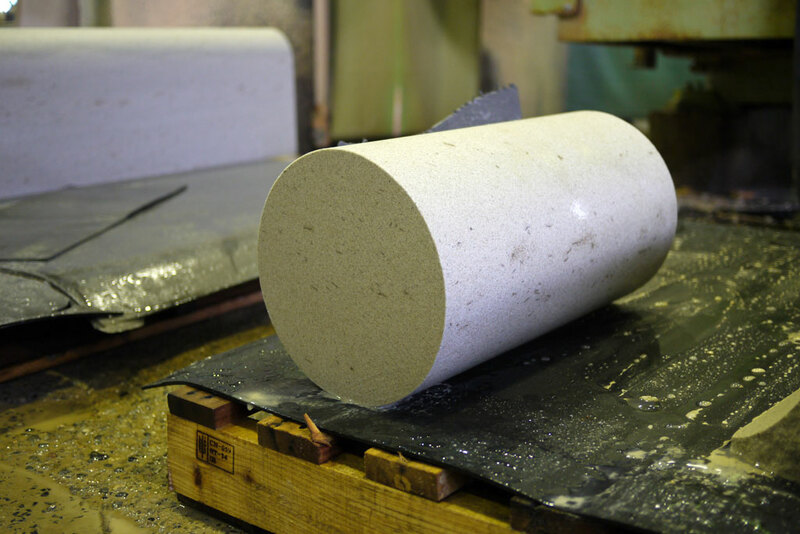 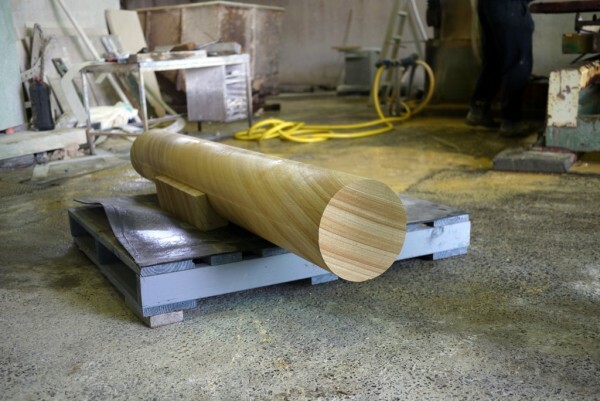 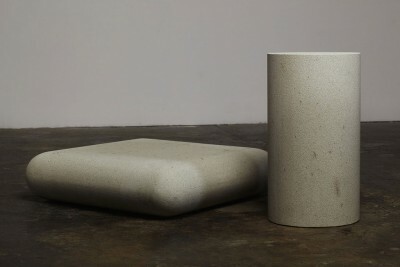 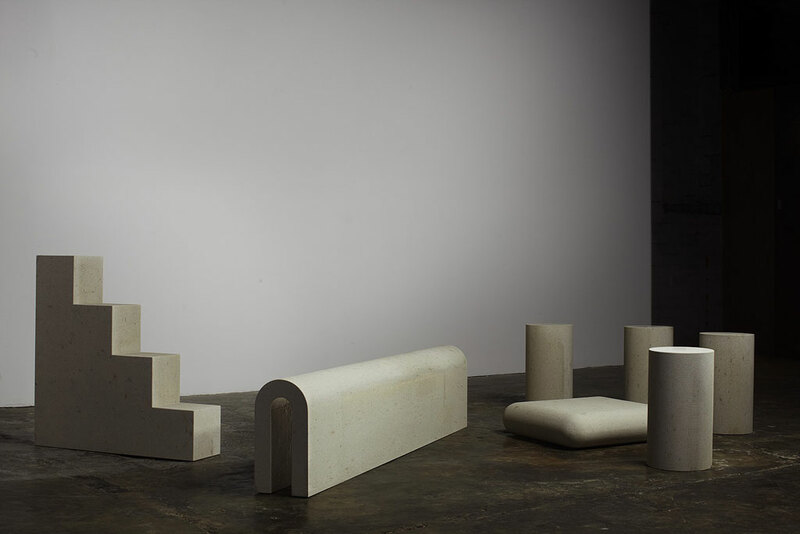 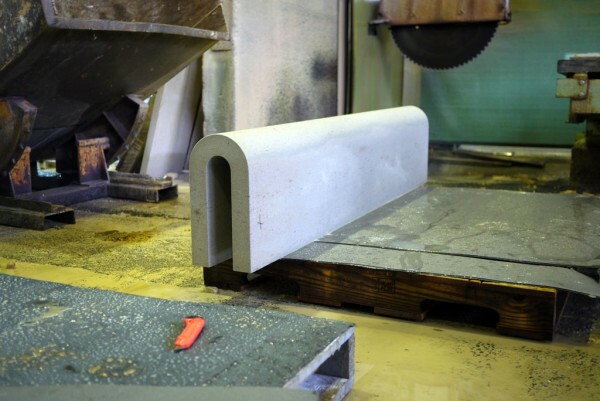 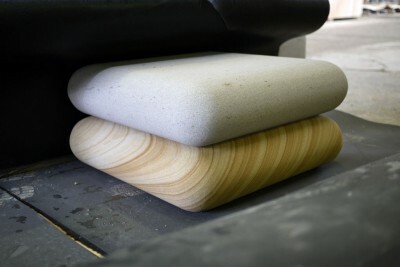 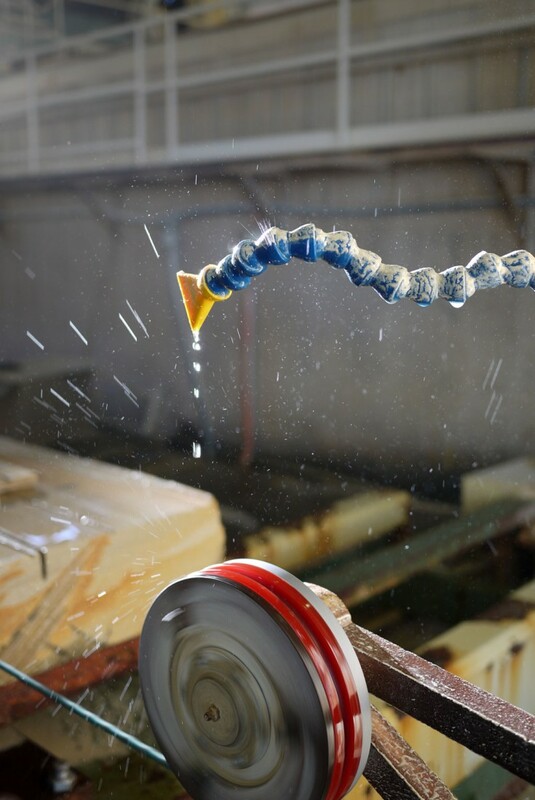 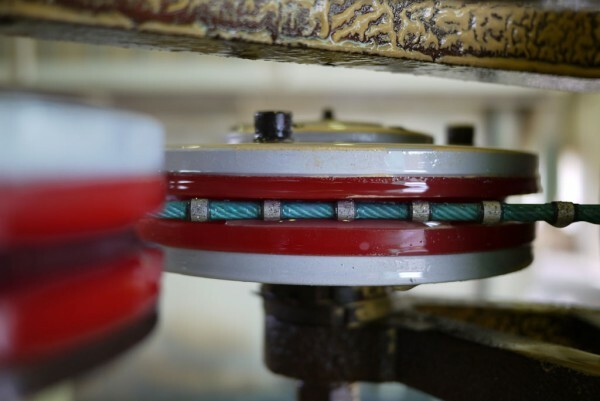 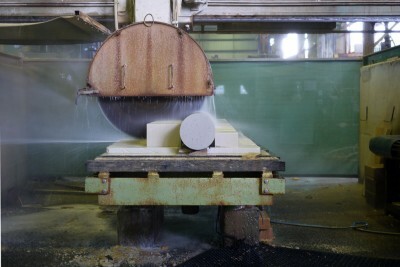 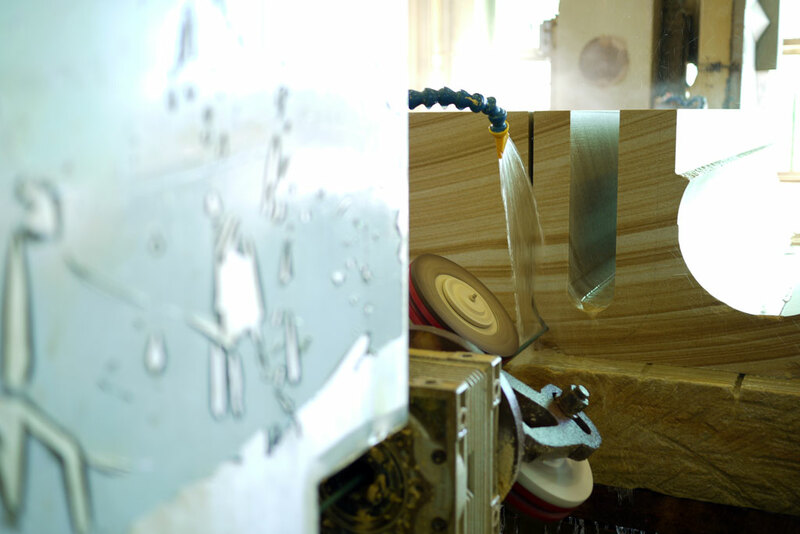 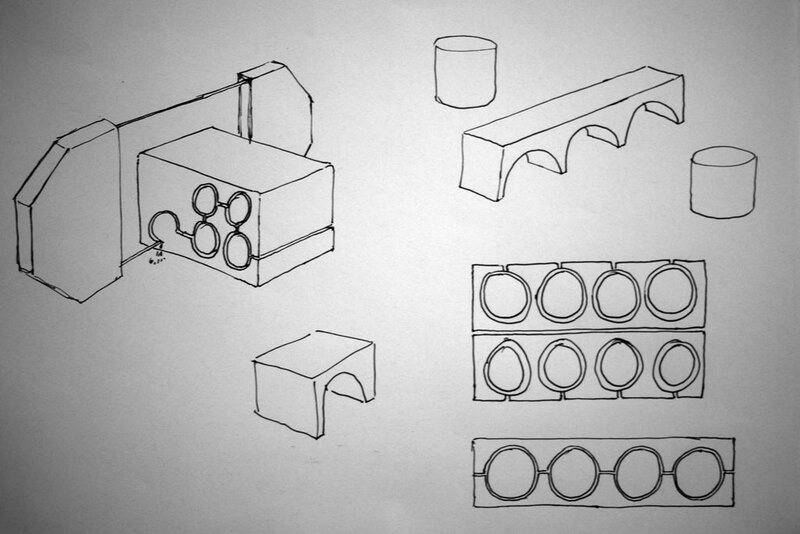 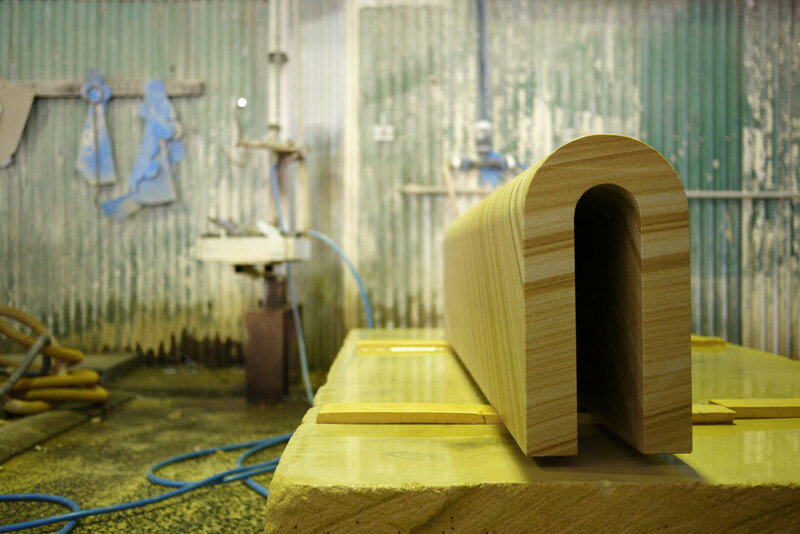 After an intensive period of research I travelled to Sydney for one month of development and production focused on creating a collection of furniture using the local sandstones. 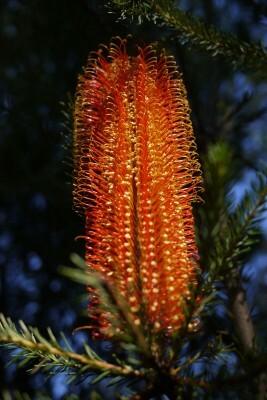 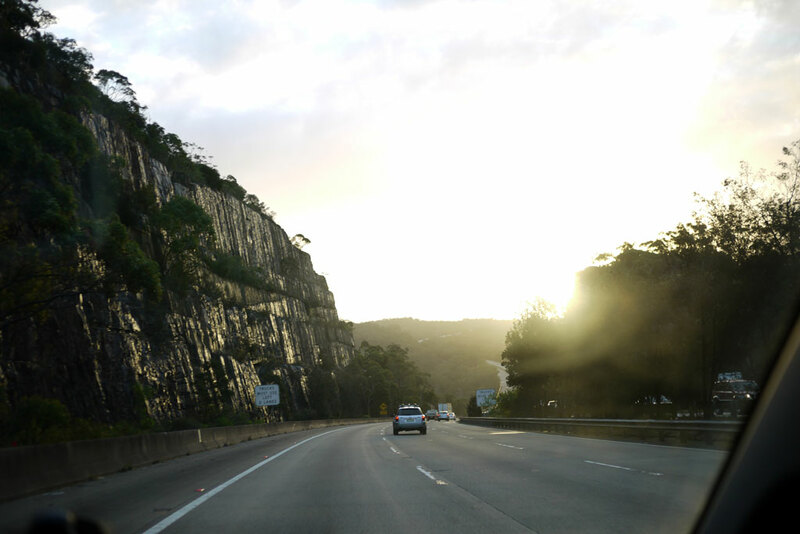 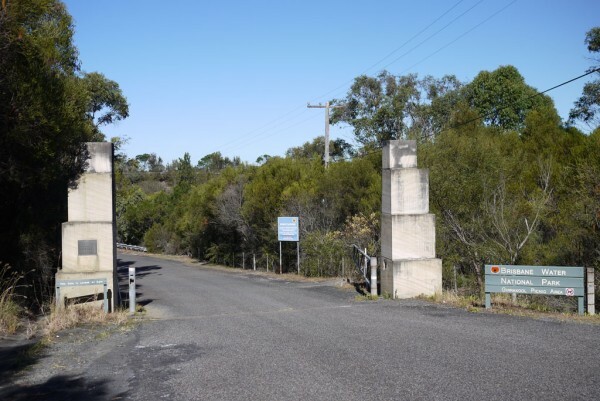 While researching the First Fleet, I learnt that during the first year of colonial settlement Governor Arthur Phillip, in search of useful natural resources, explored the area that would later become Gosford and Brisbane Water National Park. 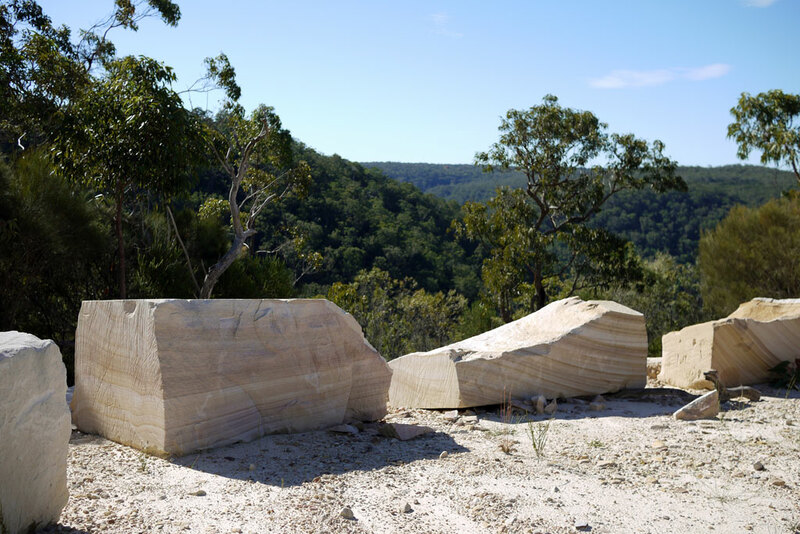 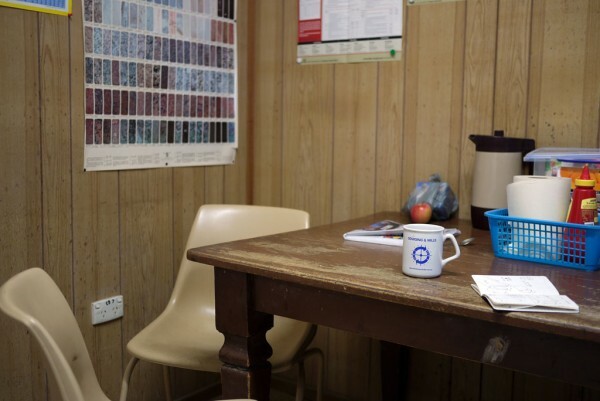 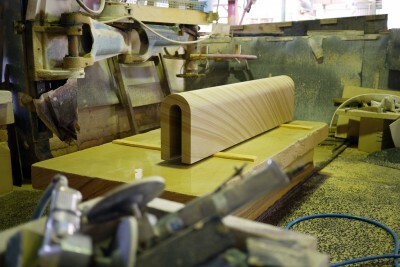 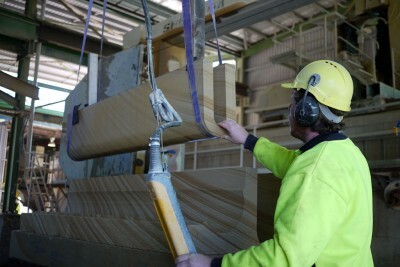 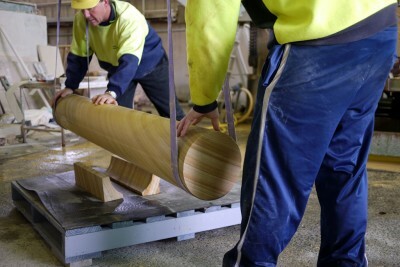 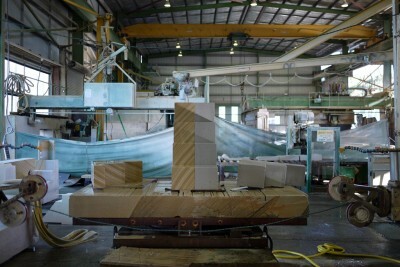 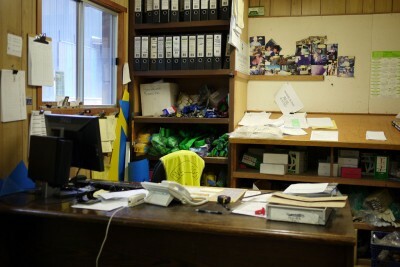 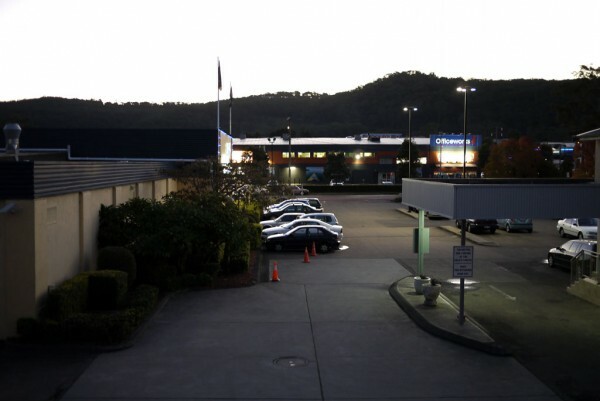 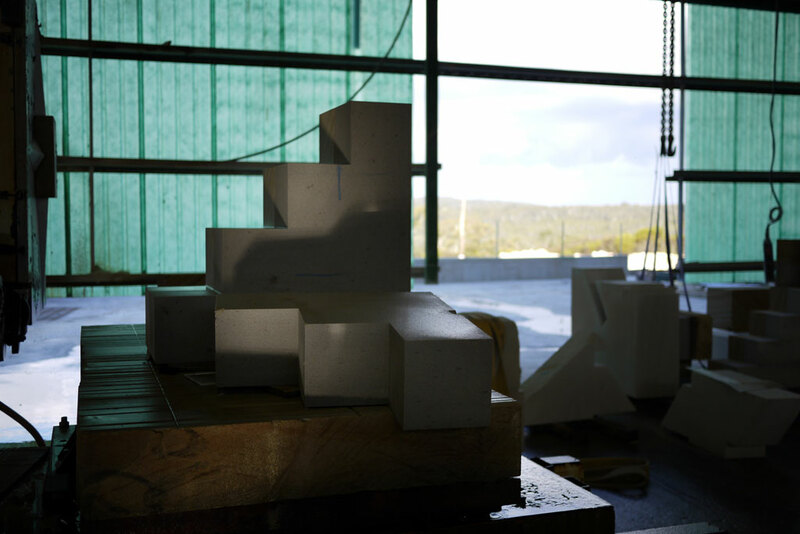 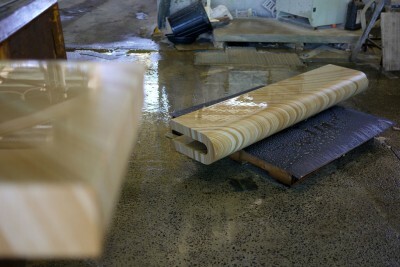 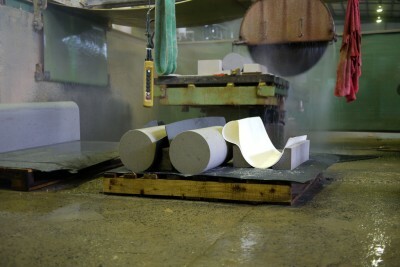 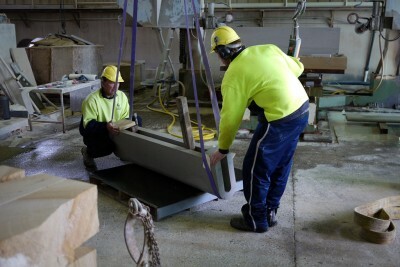 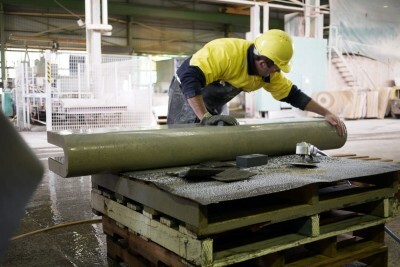 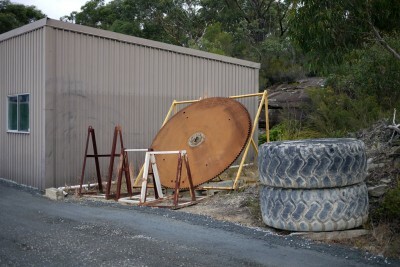 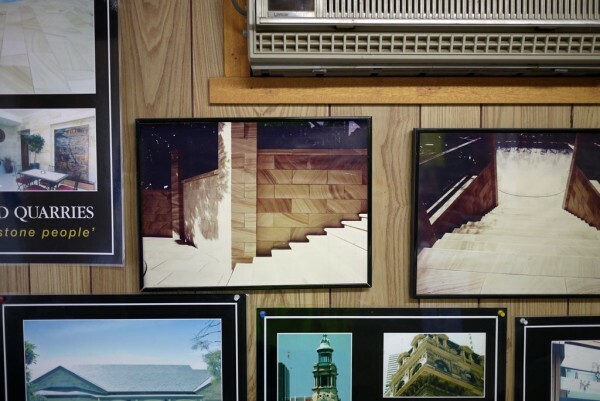 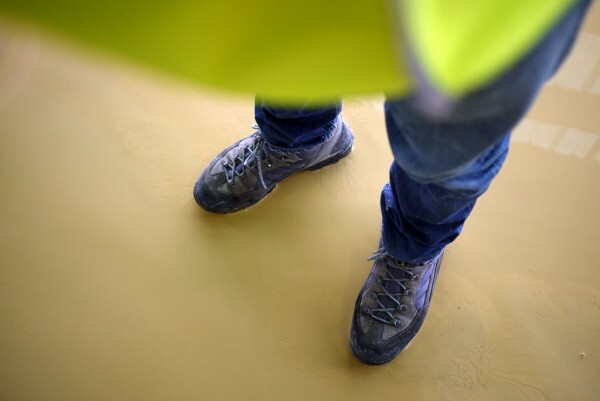 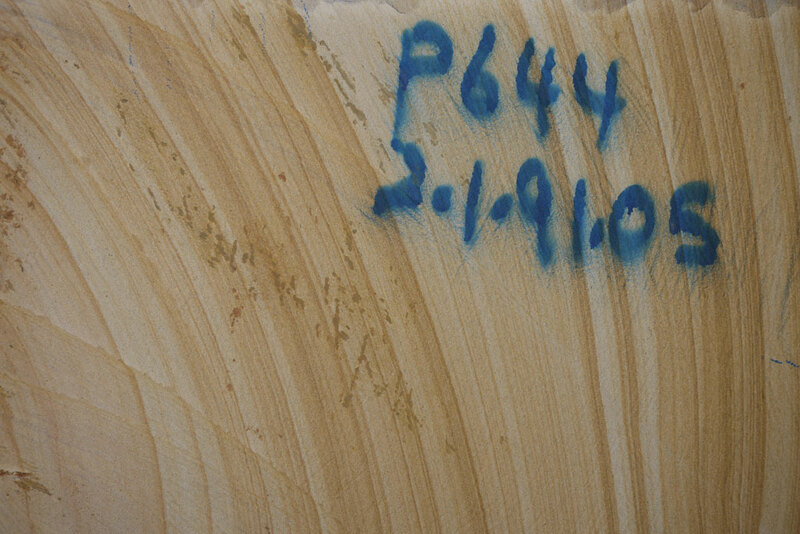 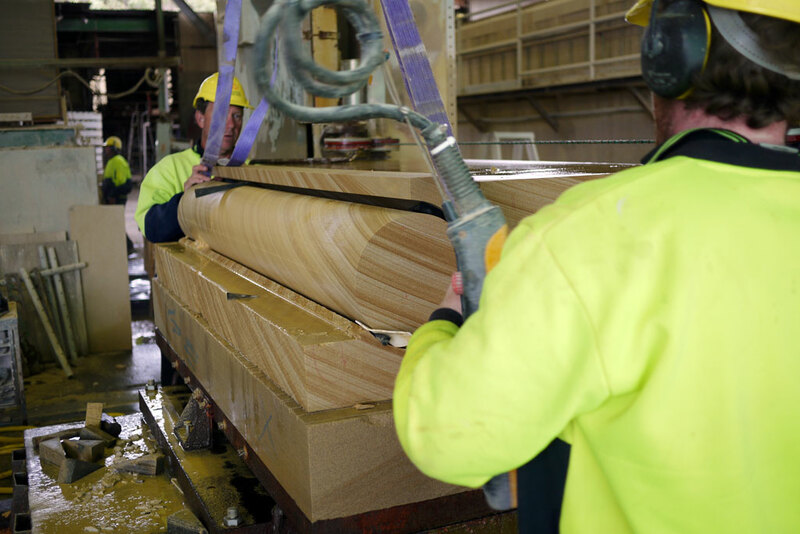 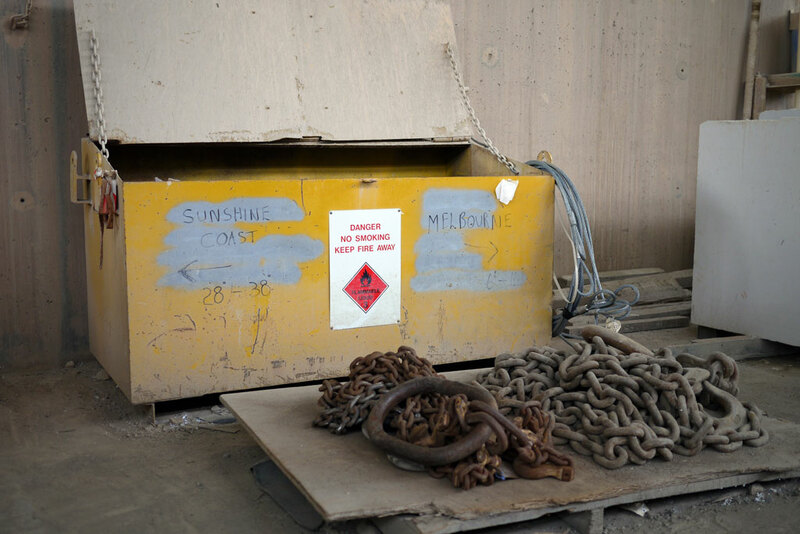 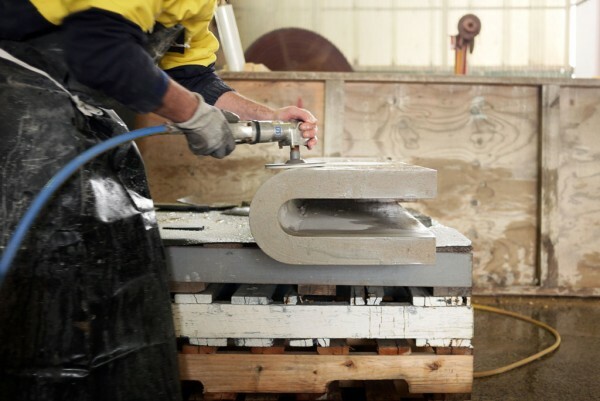 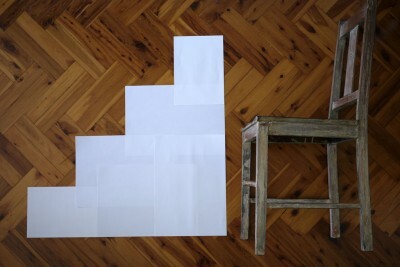 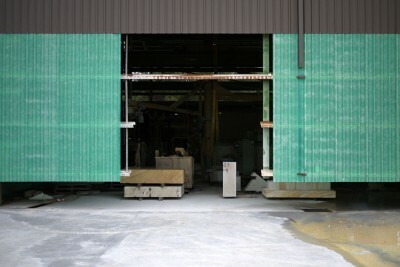 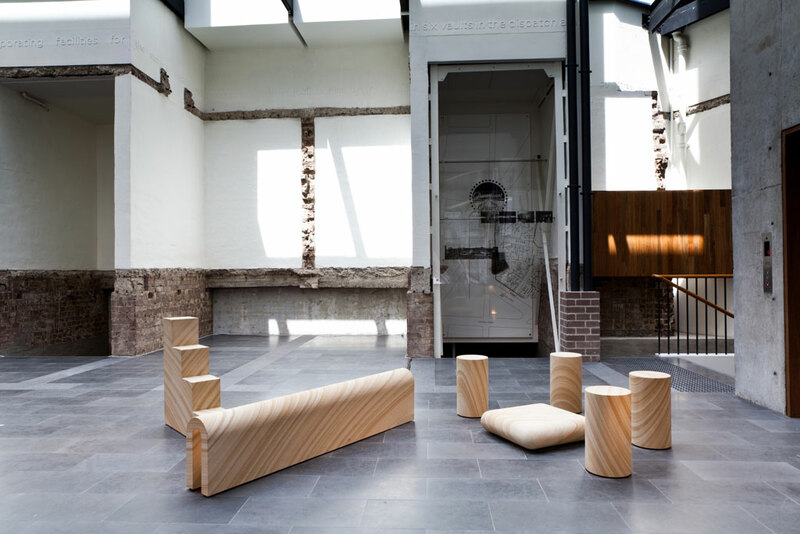 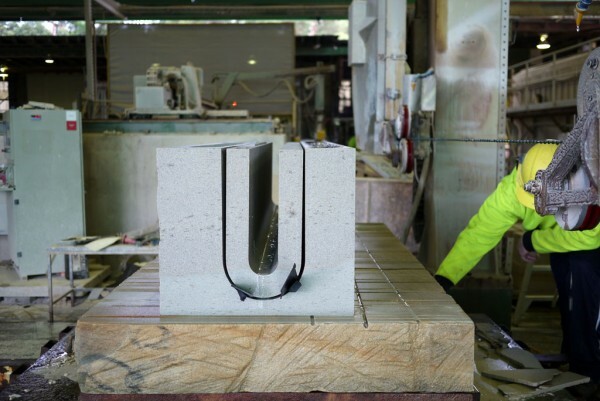 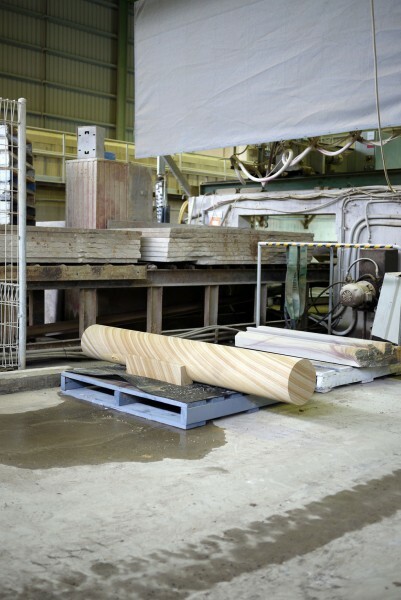 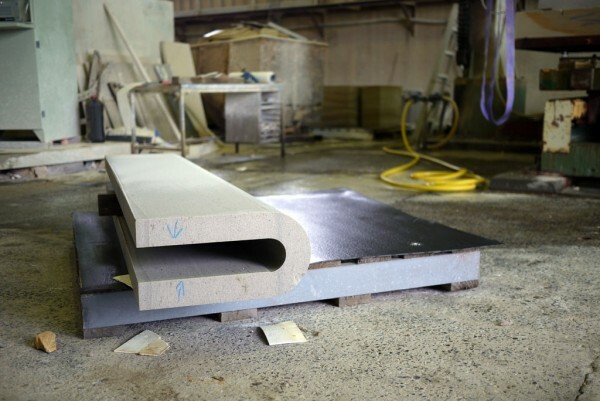 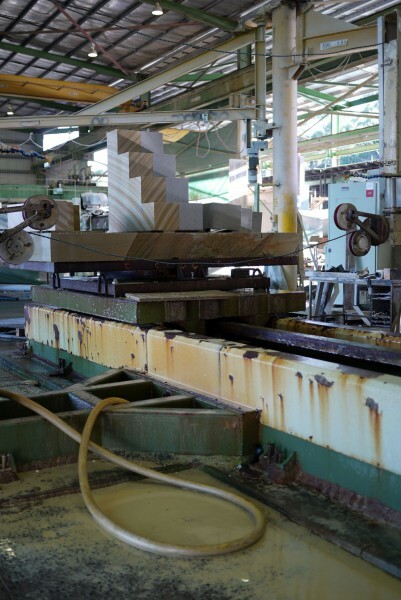 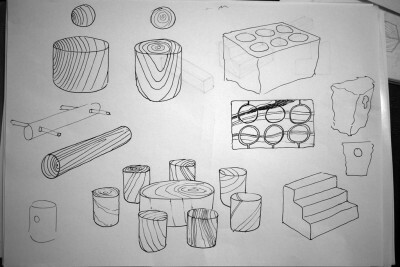 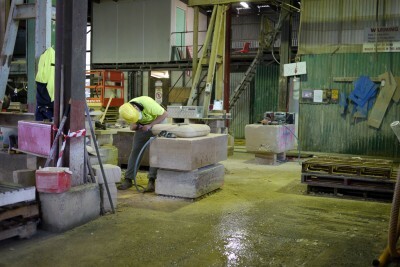 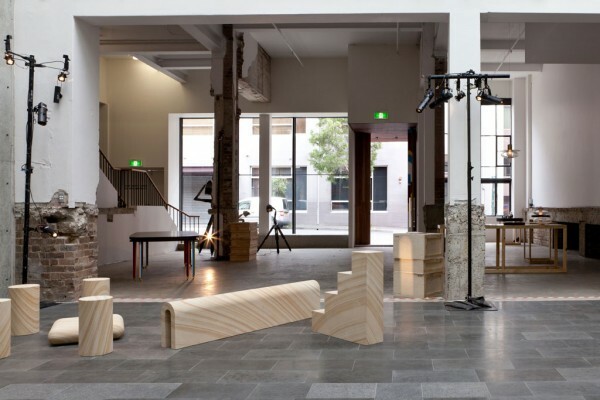 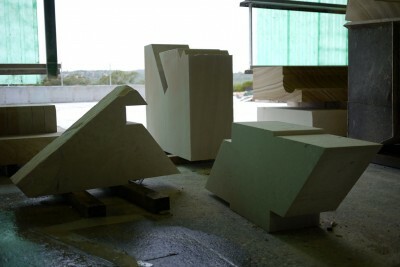 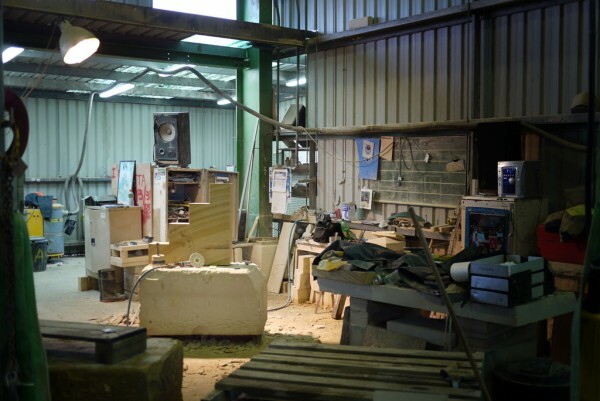 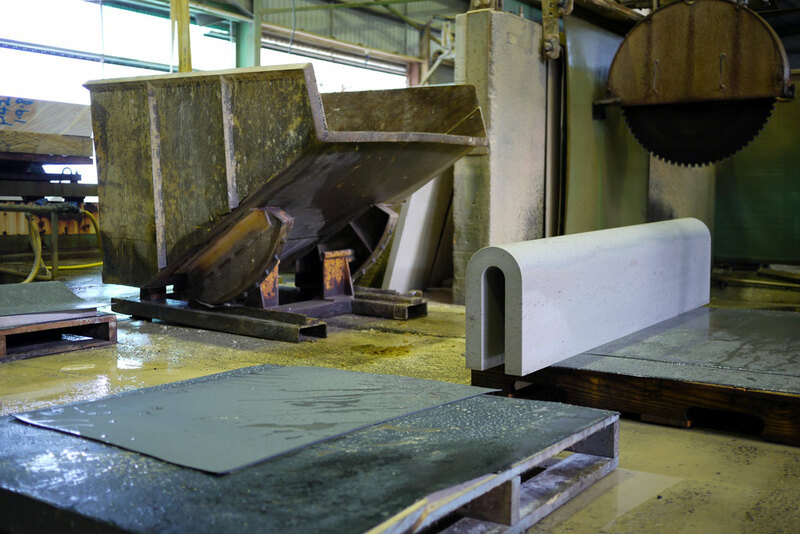 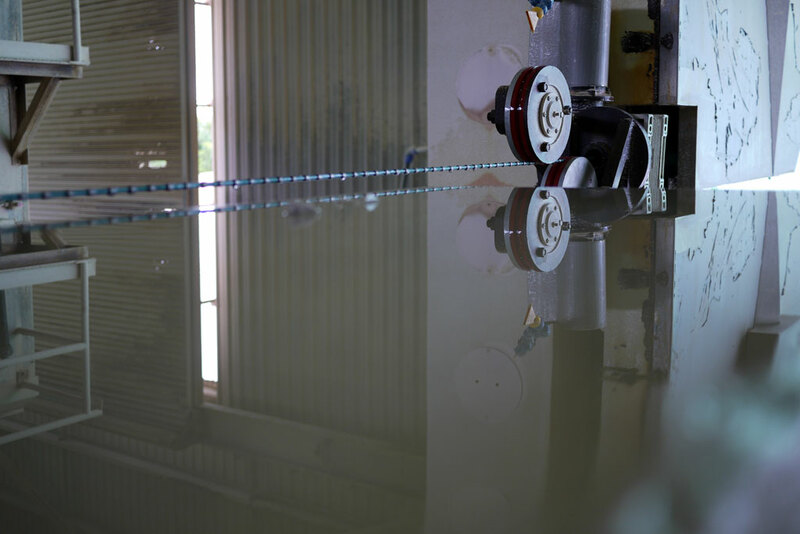 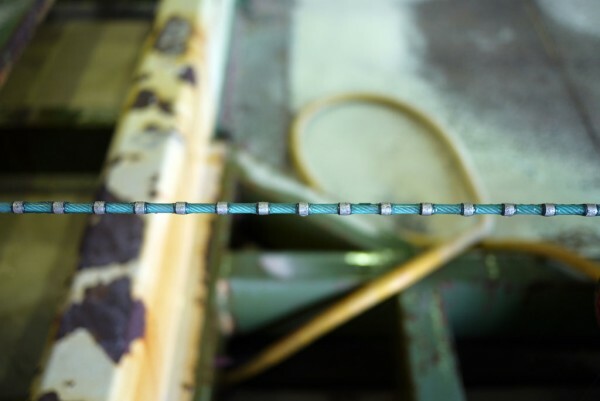 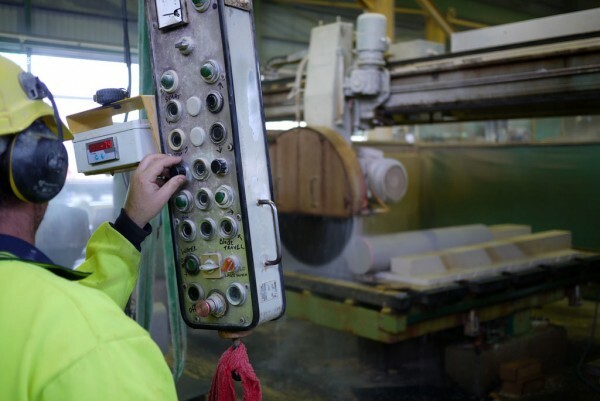 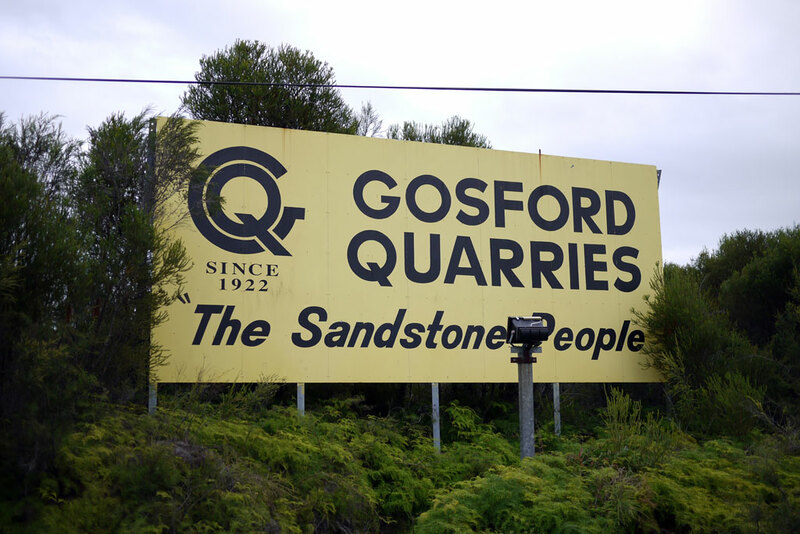 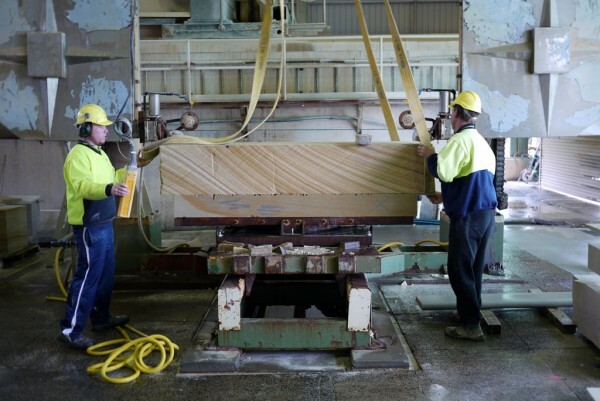 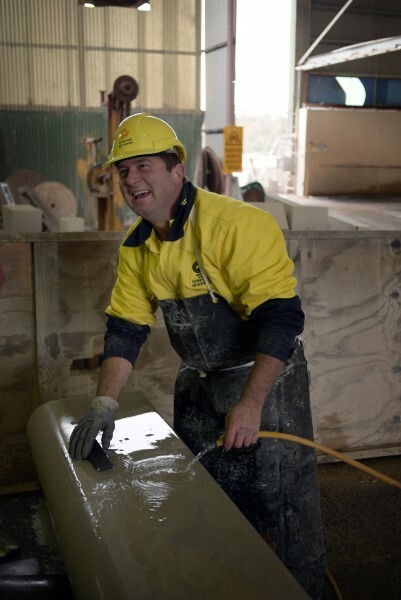 The locality of Gosford Quarries, specifically those at Wondabyne and Mount White, provided a crucial connection for my idea to create a furniture collection representing the basic furniture needs during the first months of settlement. 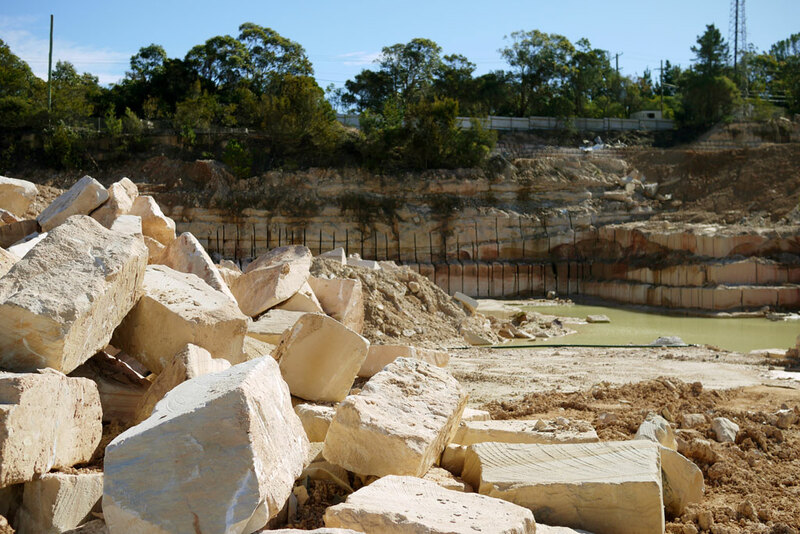 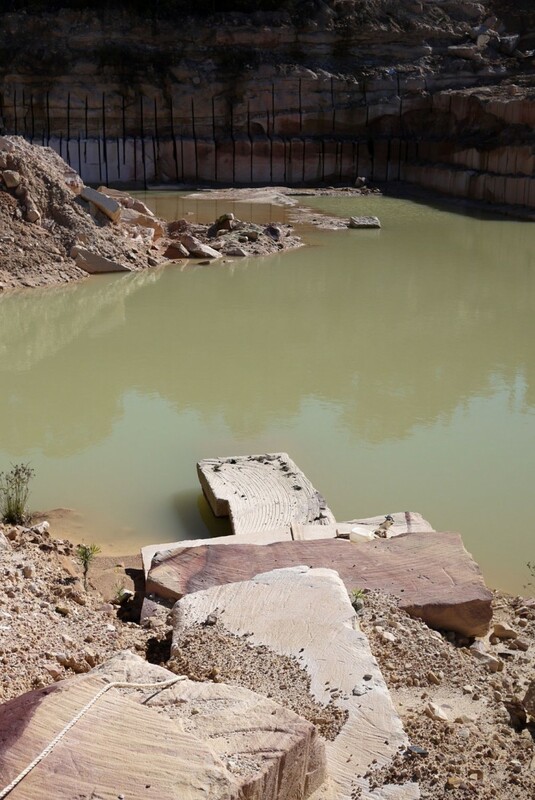 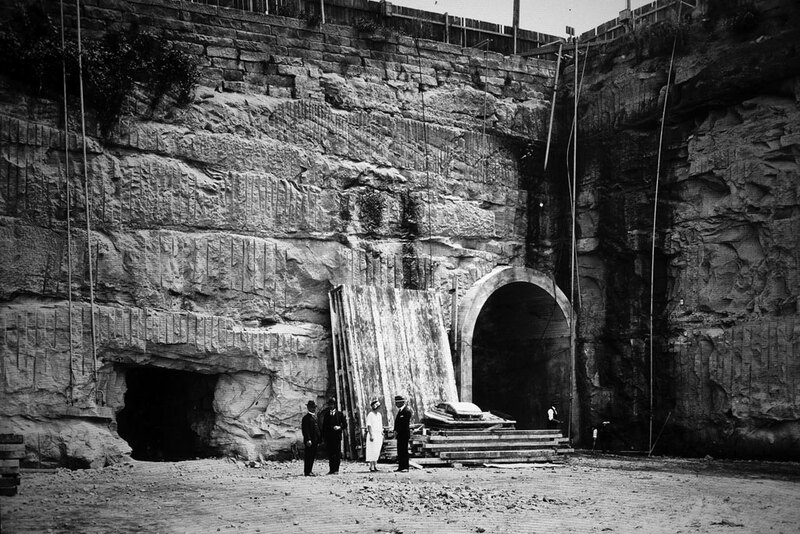 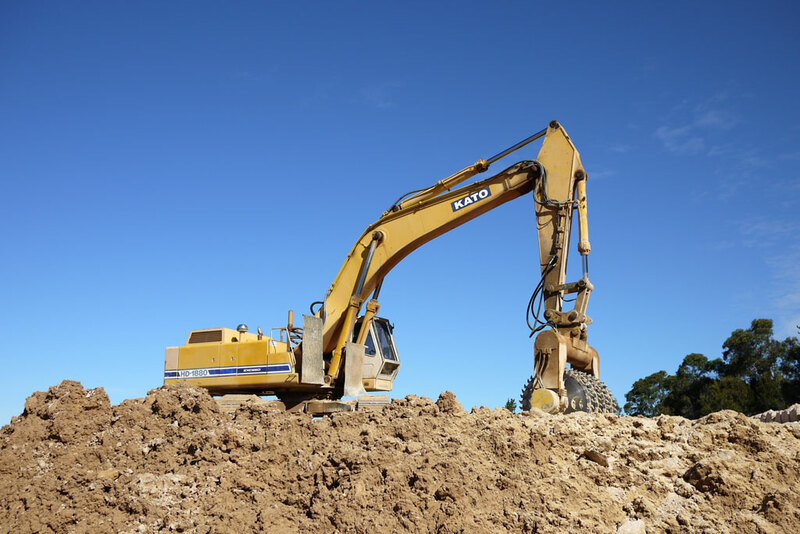 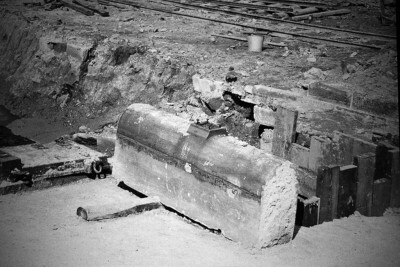 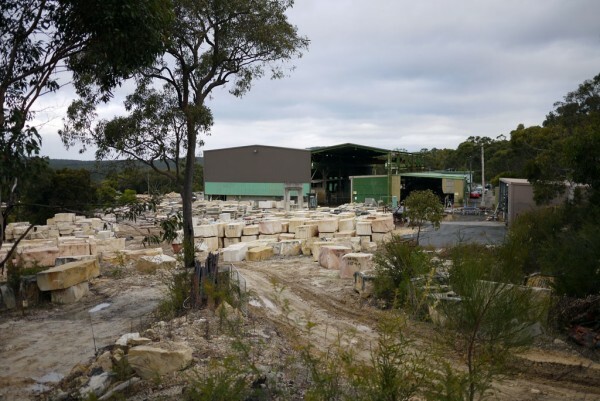 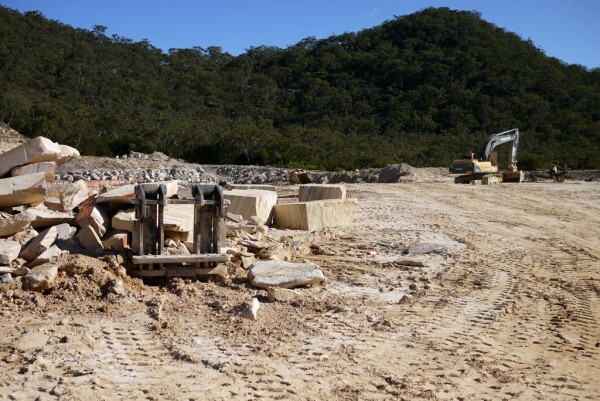 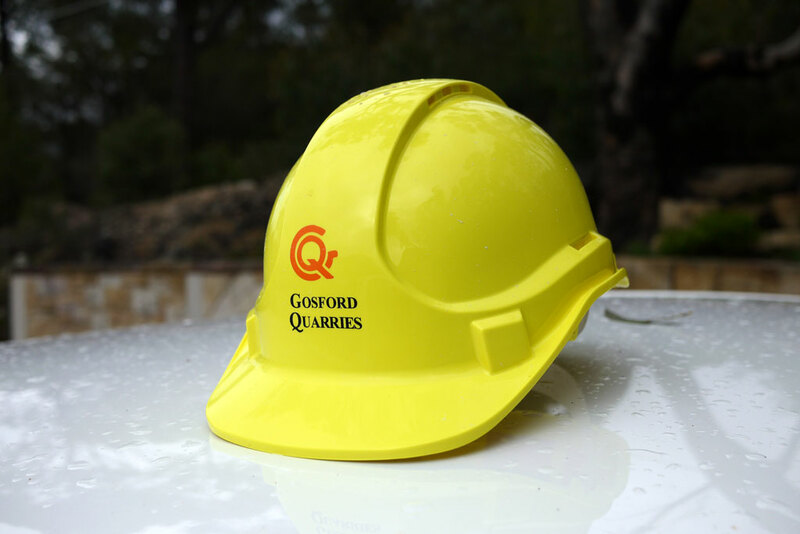 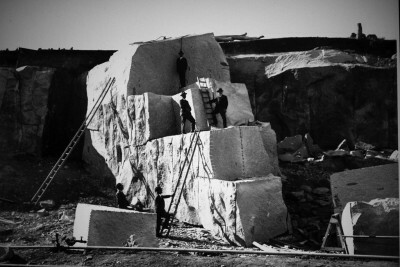 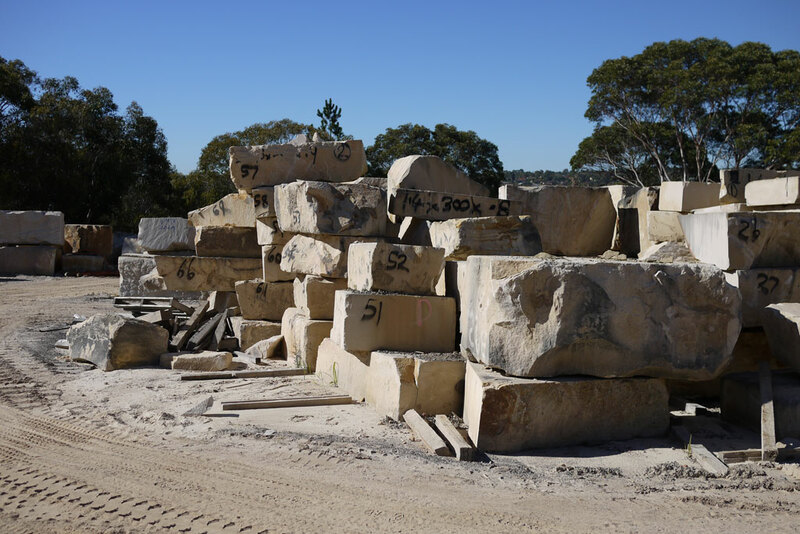 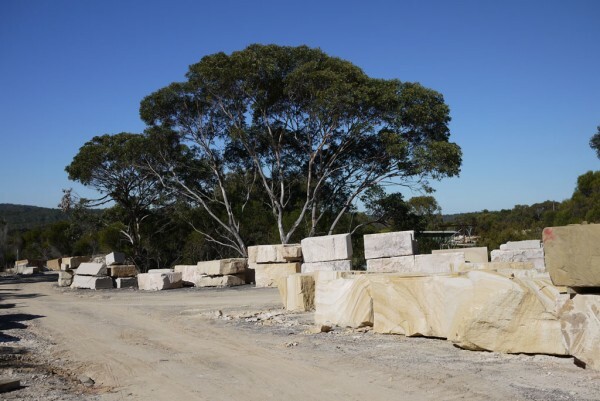 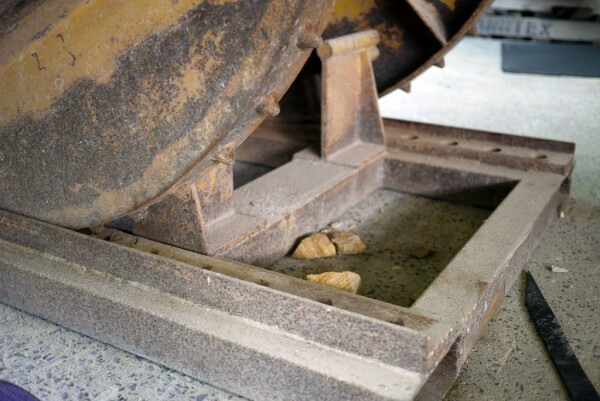 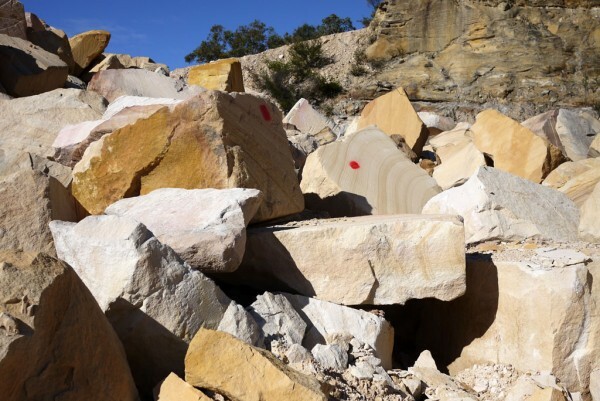 Contrary to previous stone projects, when I arrived at the Hawkesbury sandstone quarries I discovered that the overburden boulders, inherent to the quarrying process, had been used to backfill old sections of the quarry. 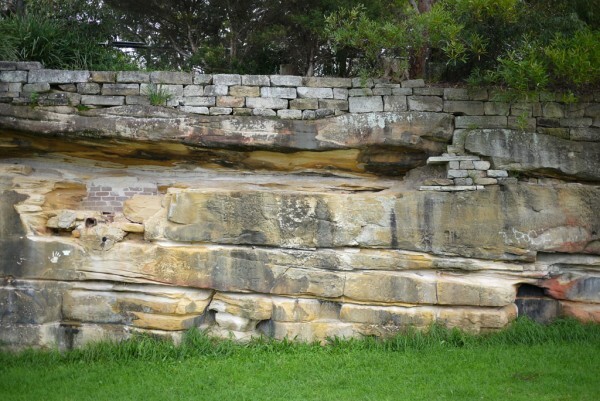 The absence of natural boulders steered me towards the creation of a highly refined collection cut from regular ashlar blocks, each one with a direct correlation to my research on art of the colonial period, the necessary resourcefulness of the first colonists, and the geology and topography unique to Sydney. 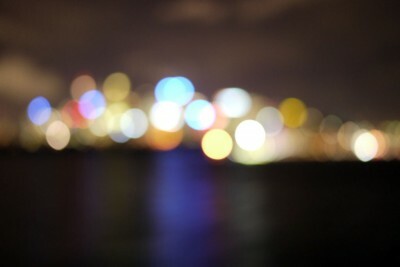 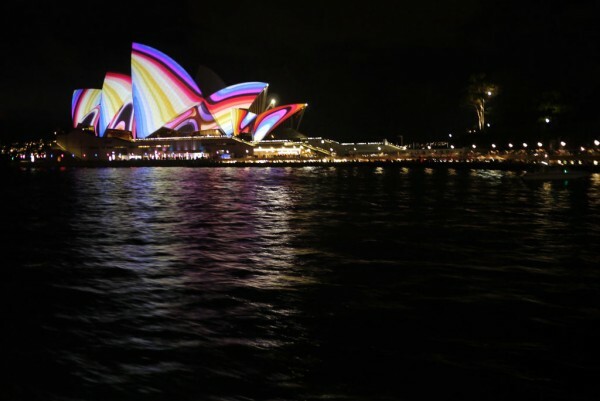 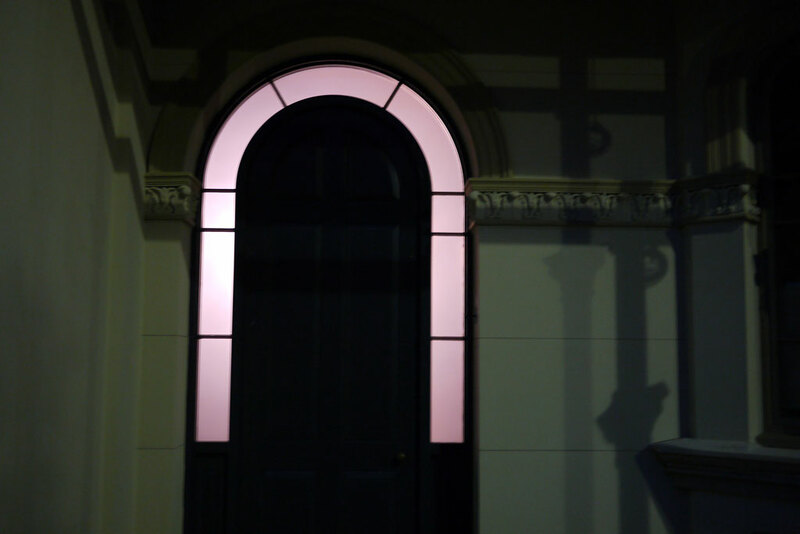 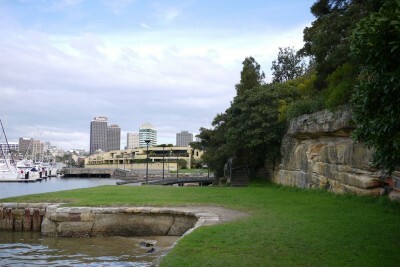 The steps began as an investigation of Mrs Macquarie’s Chair which boasts one of the best vantage points across Sydney Bay. 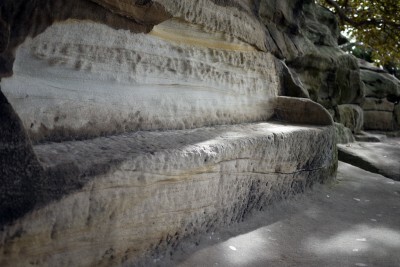 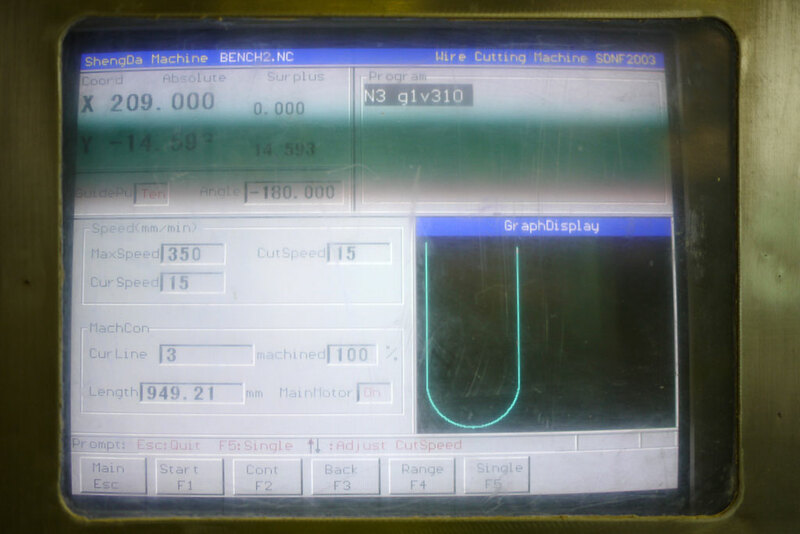 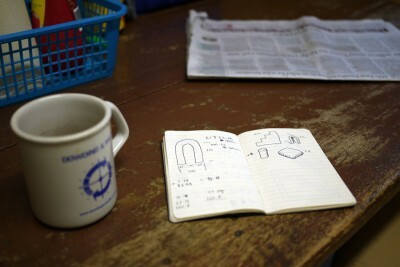 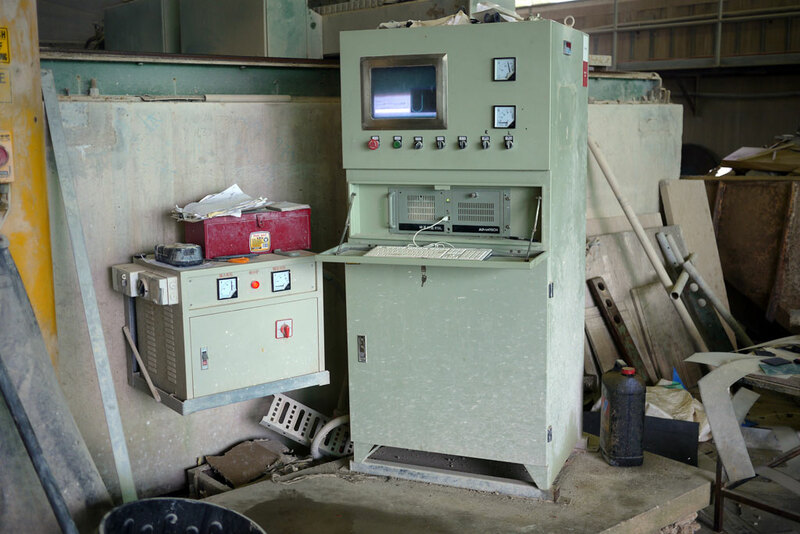 On visiting the site I discovered that the seat was so large it required steps to lead up to its various levels. 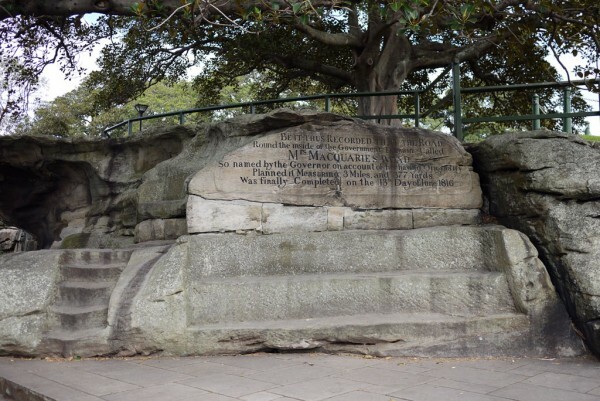 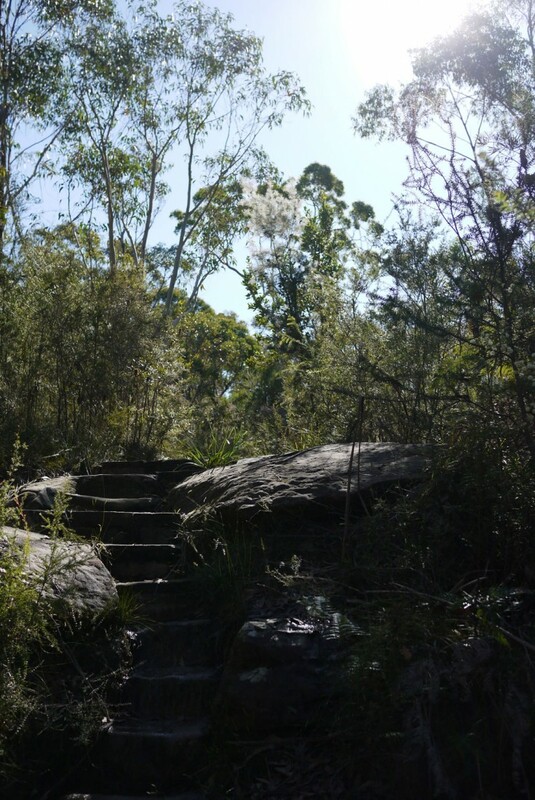 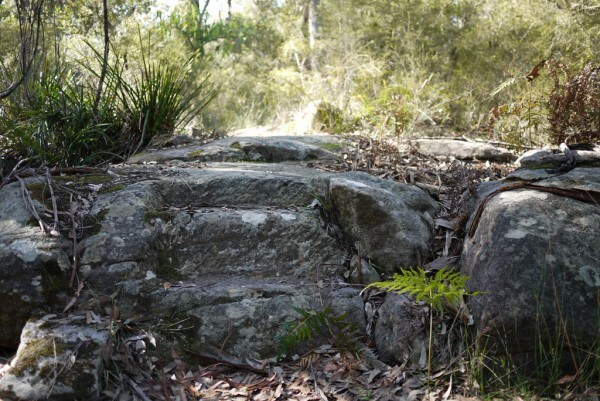 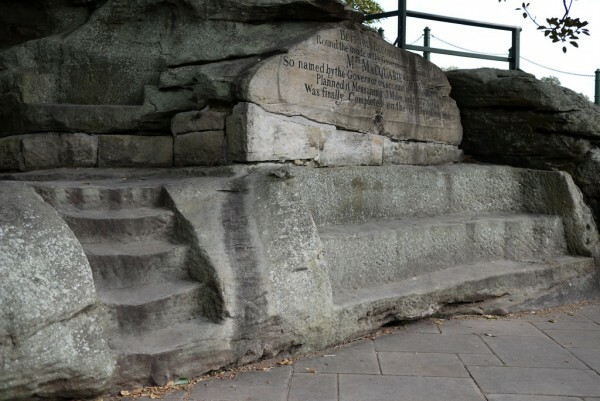 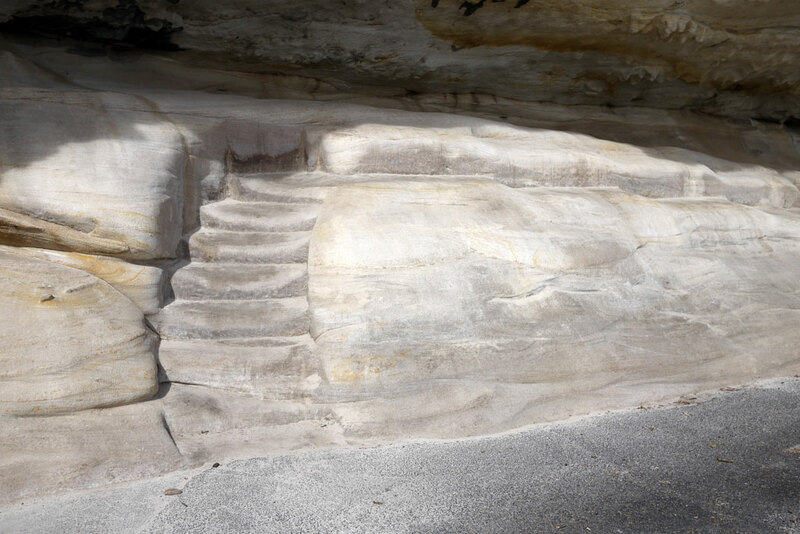 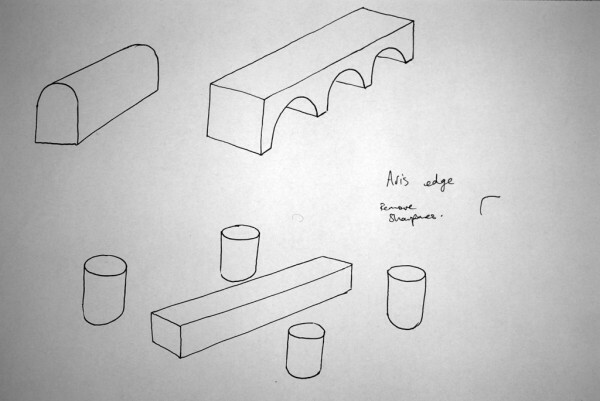 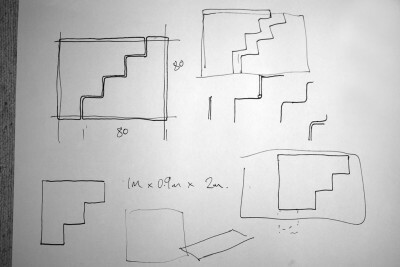 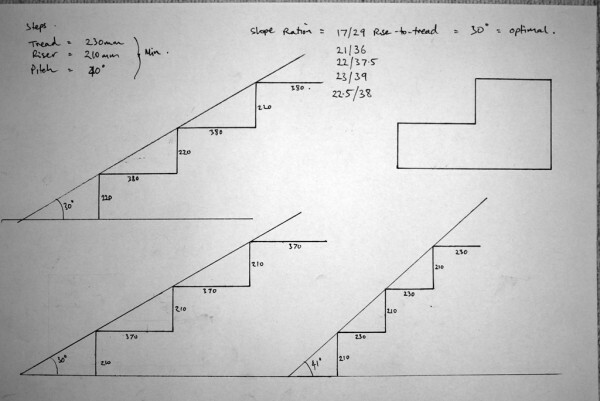 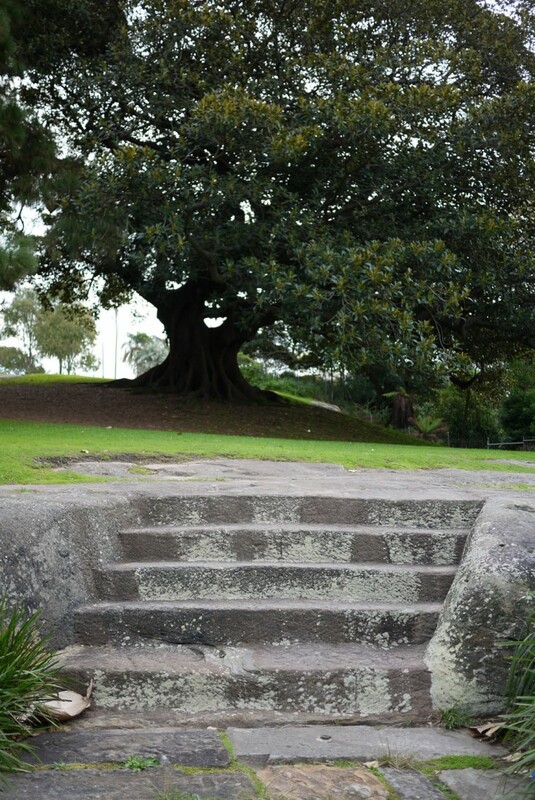 The steps to Mrs Macquarie’s Chair resulted in an investigation of steps and staircases carved directly into the sandstone around Sydney, finally leading to research into freestanding stone steps, such as horse mounting steps. 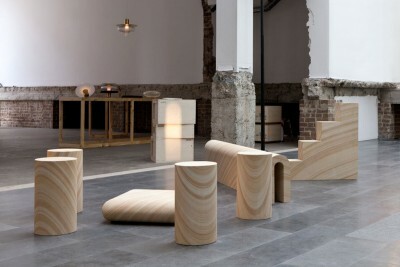 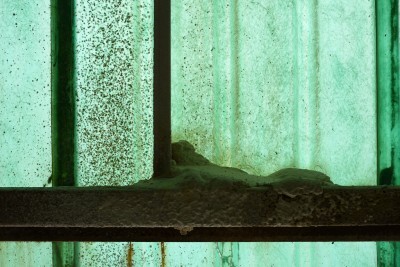 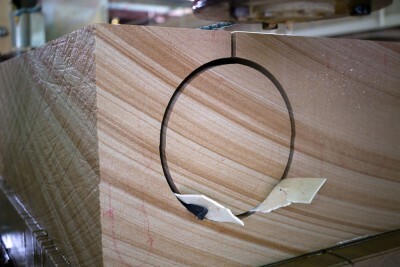 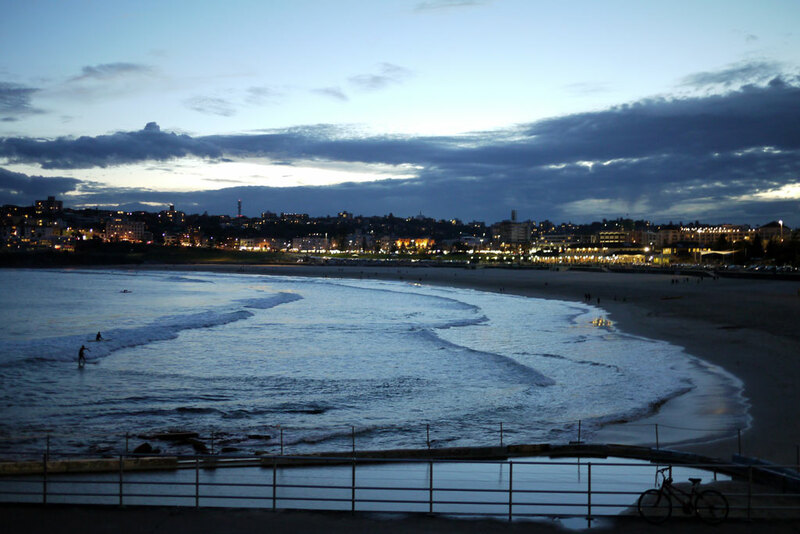 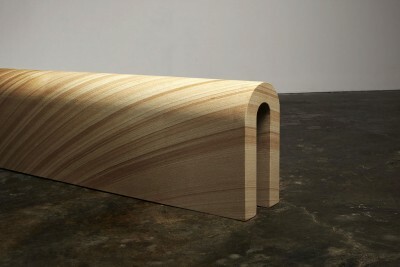 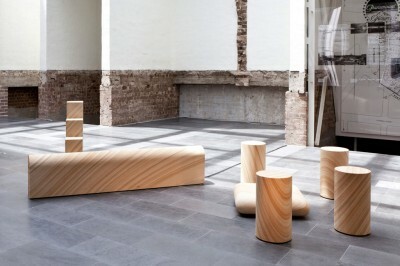 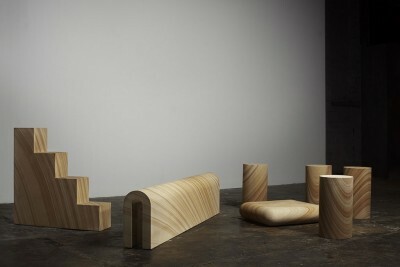 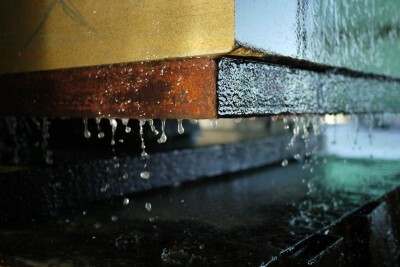 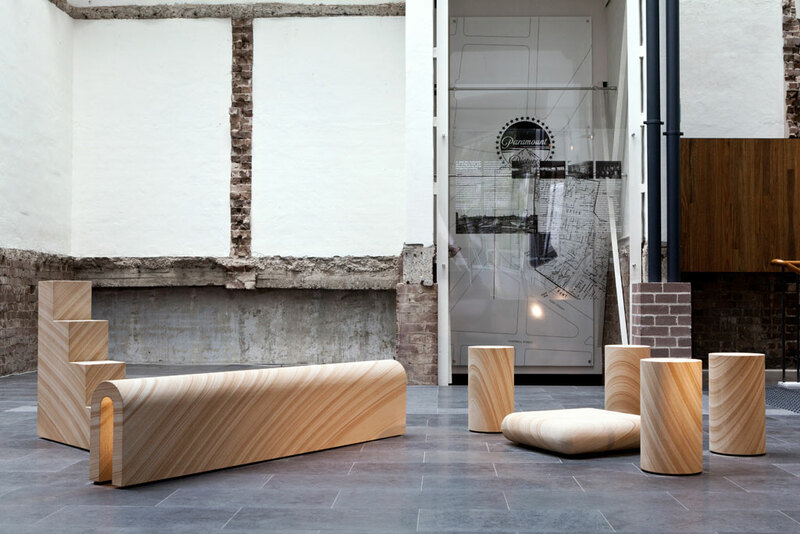 The table references the sandstone rock faces exposed along the shoreline of Sydney Bay and within the city. 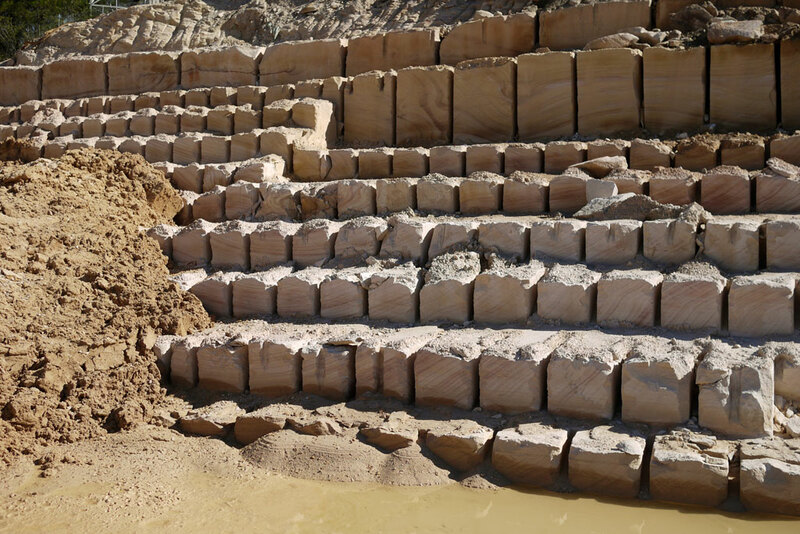 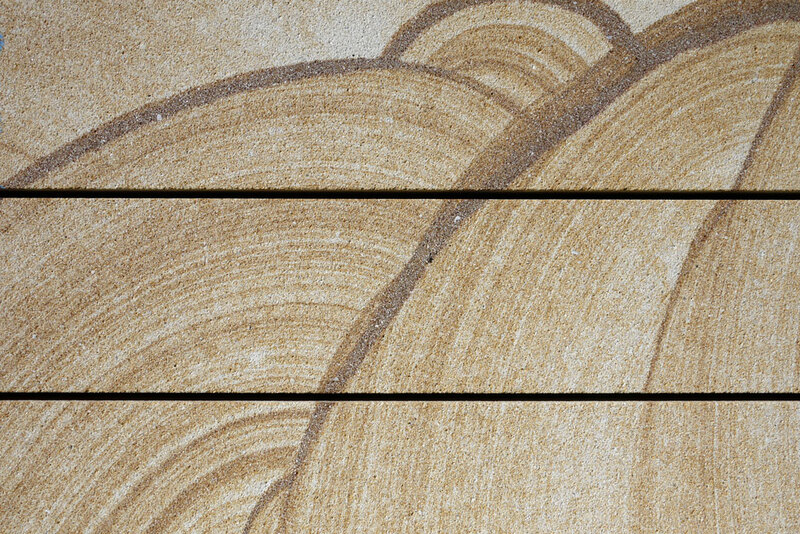 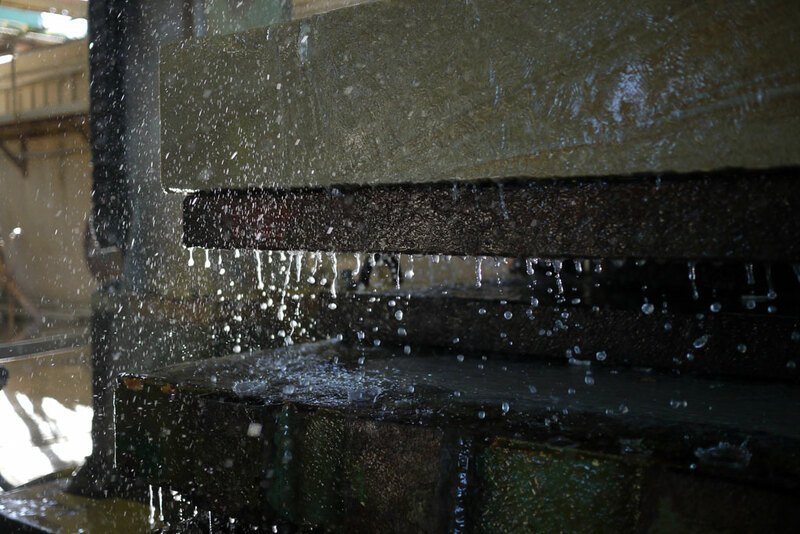 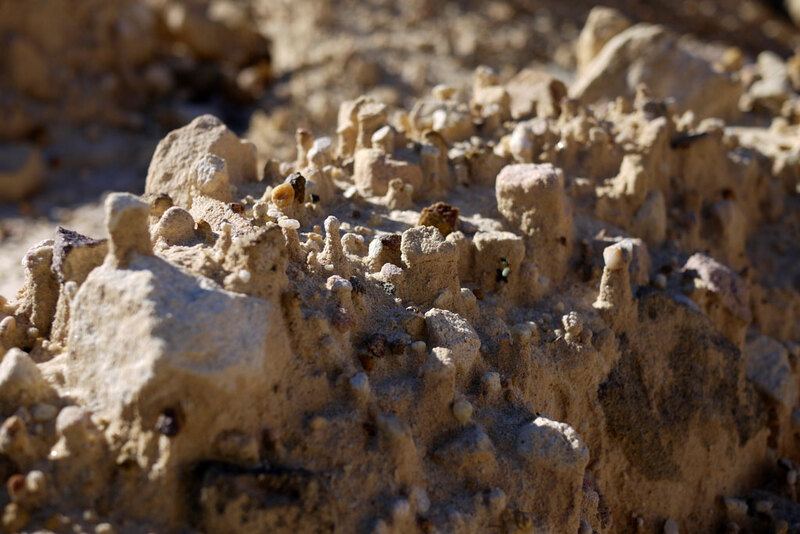 Over time rain erodes the organic sediment dividing the layers, turning the sandstone into what appears to be a series of varying scaled blocks and slabs. 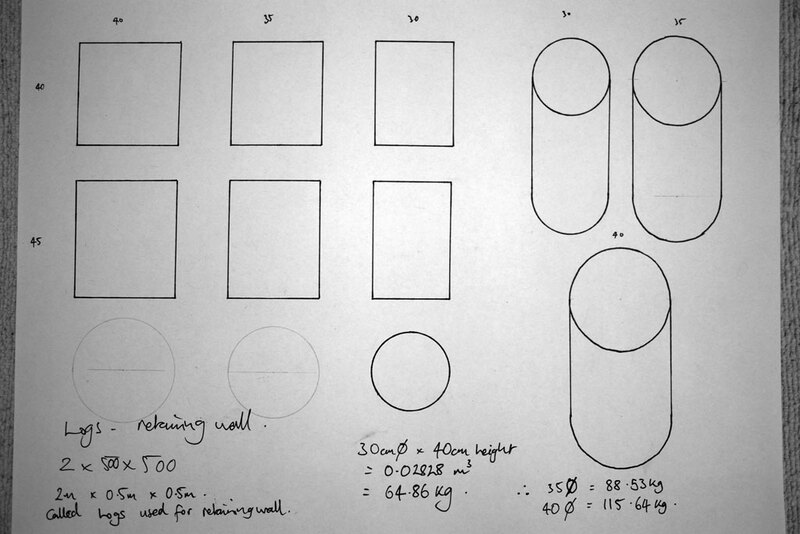 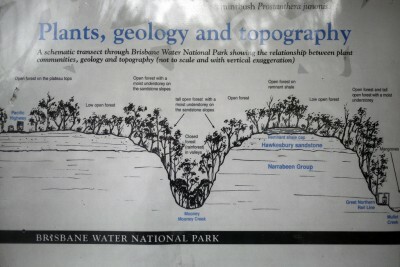 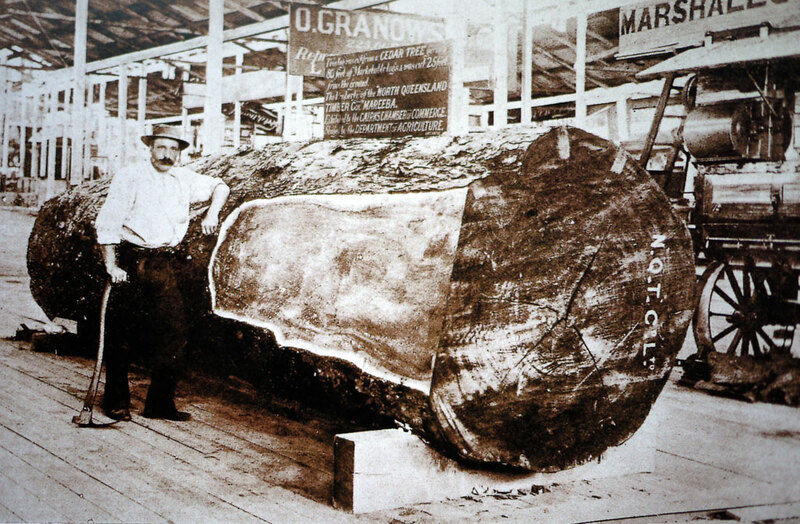 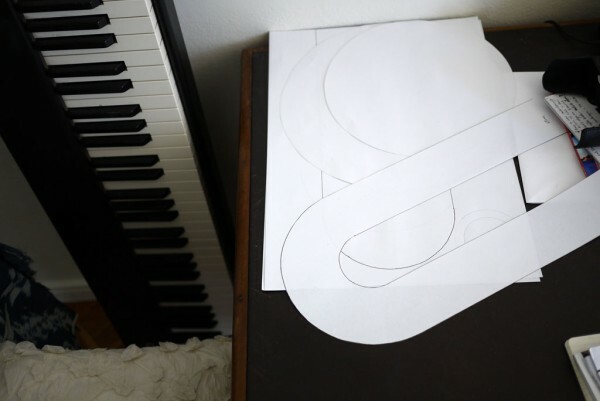 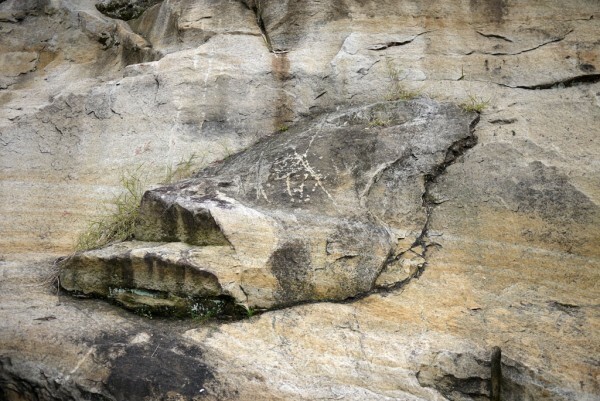 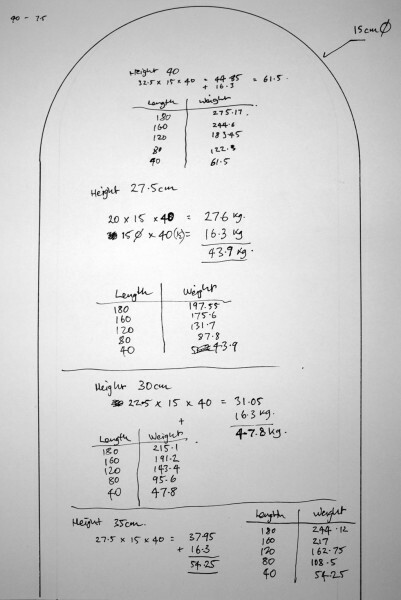 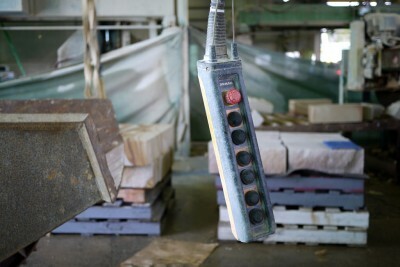 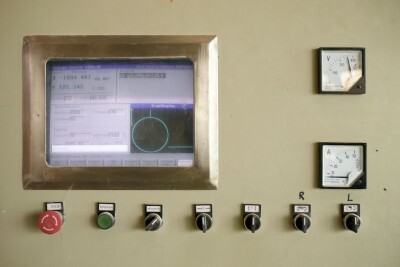 The table represents one of these slabs – as if pried from the rock-face using a crowbar – offering a convenient surface raised from ground-level on which to place objects. 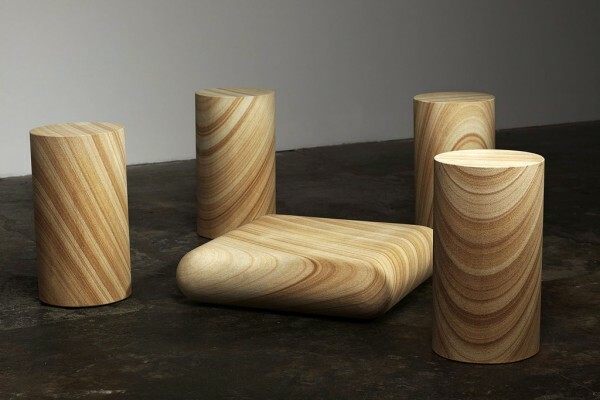 The stools directly reference roughly sawn tree stumps which appear to be the off-cuts from a non-furniture related process, frequently sat upon by figures in colonial period paintings. 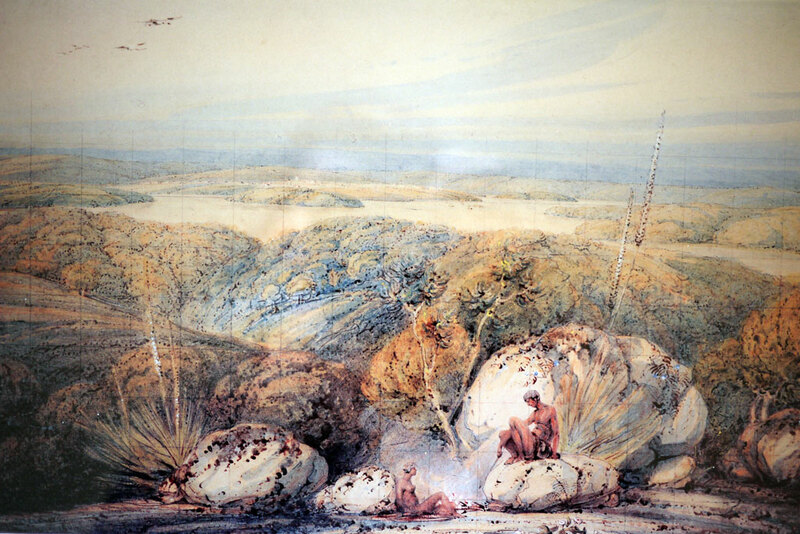 In a highly active environment, where few comforts existed, the creation of permanent furniture was necessarily secondary to food, security and shelter. 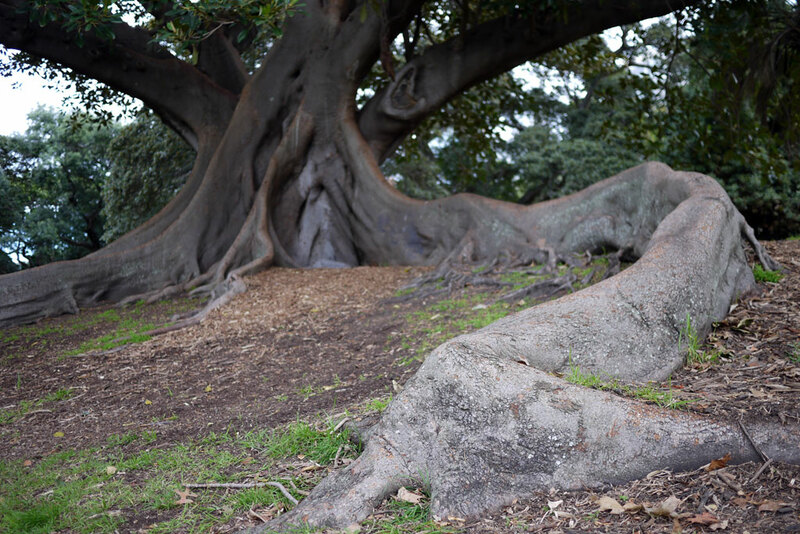 The bench describes a cross-section cut from the protruding roots of a mature fig tree, an unusual feature that must have intrigued the early colonists as much as they have inspired me. 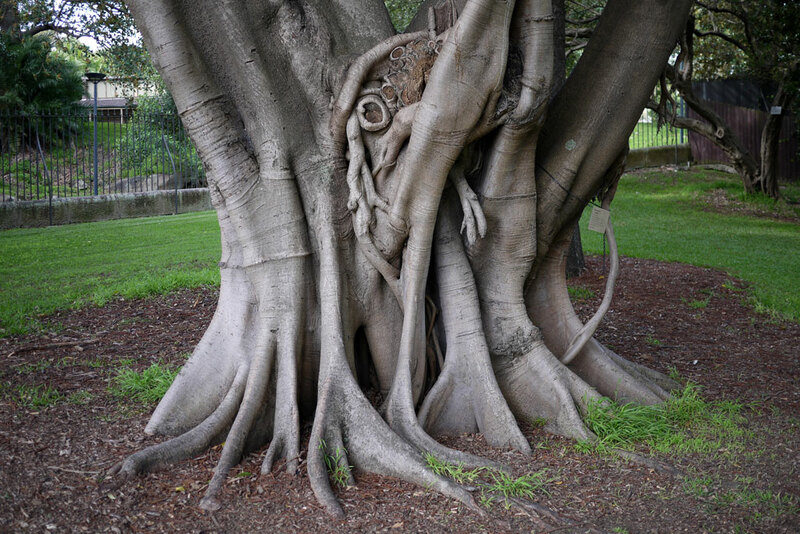 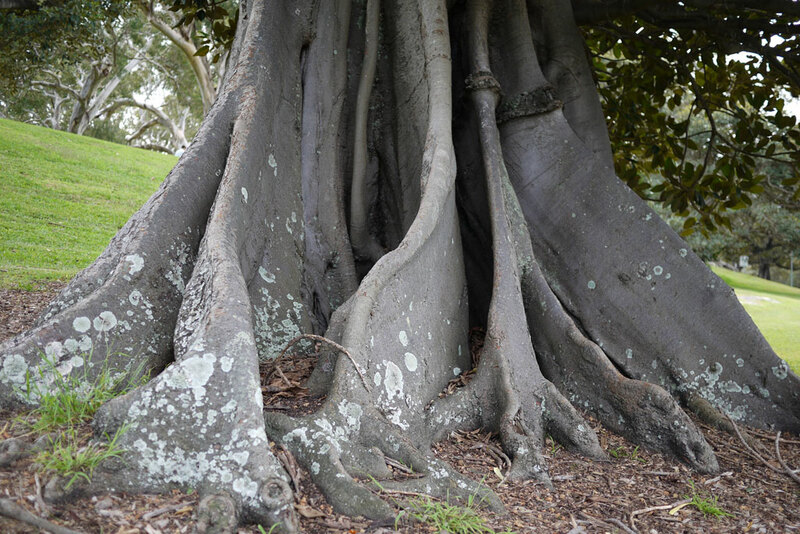 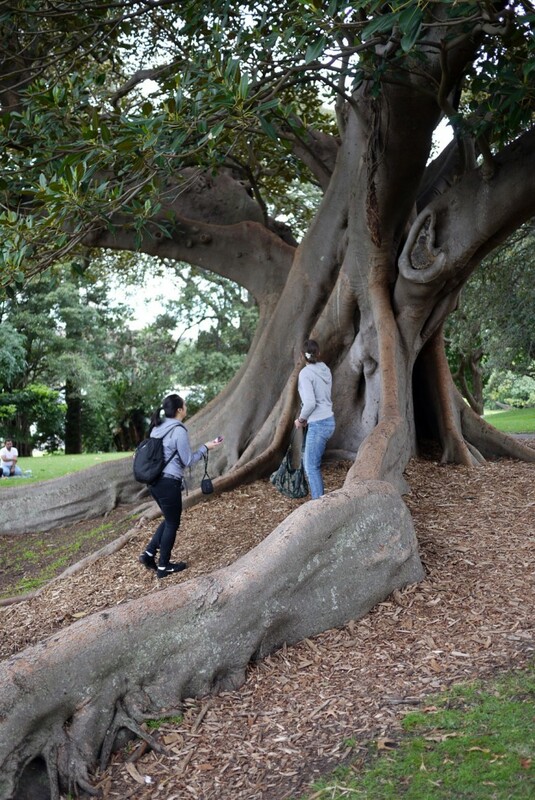 A species prevalent throughout the east-coast of Australia, the fig tree’s sprawling, exposed roots combined with the shade offered by its large canopy provide a perfect resting spot. 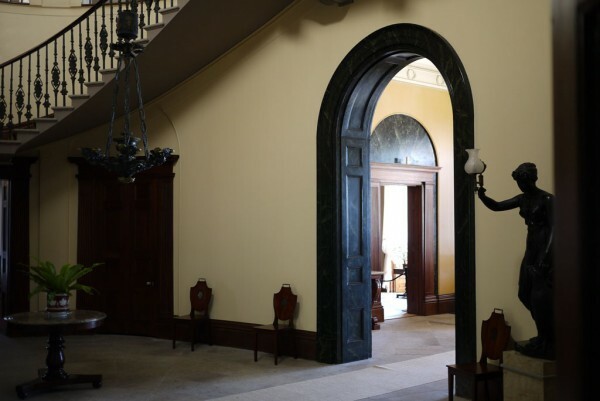 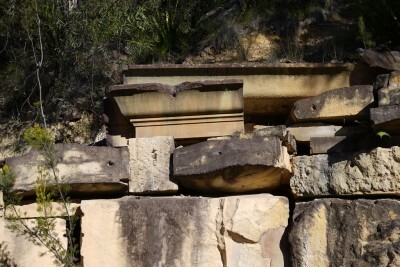 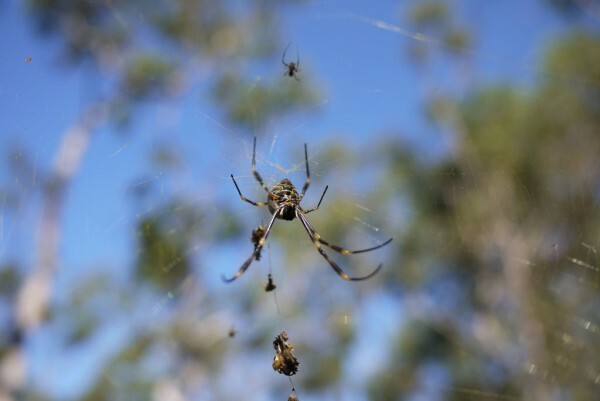 To gain a vantage point via steps, to have somewhere to place documents or food, to sit and rest independently or as a group – these are the primitive but essential activities that the Hawkesbury Sandstone Collection provide for.